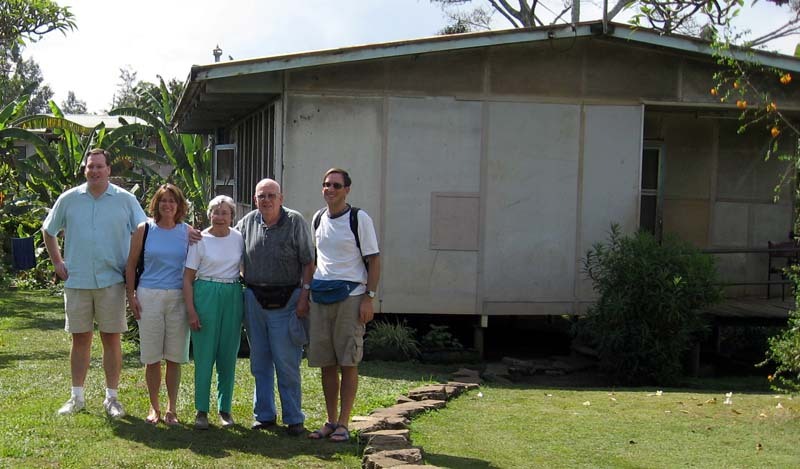 Explanation of this web page: We travelled to Goroka, Papua New Guinea and visited several places that are personally important to our family such as the house we occupied in 1972. This is part of a larger trip explained here. Click on any picture below for a REALLY high resolution version! This is the house we five family members lived in 35 years earlier, still standing. From left to right in the picture below are Brian (me), Cheryl, Virginia, Howard, and Randy. 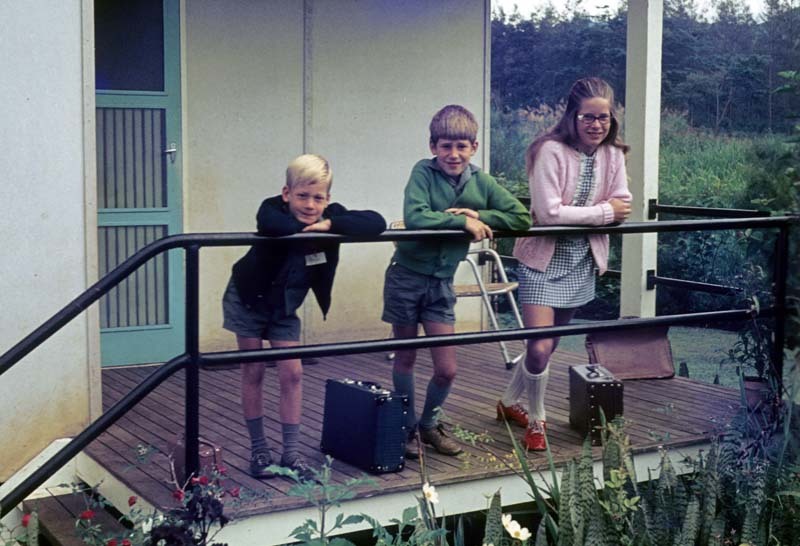 Below is a scanned picture from 34 years ago on the front porch of the same house showing the three children on the first day of school, that's Brian on the far left (5 years old), Randy (7 years old), and Cheryl (11 years old). 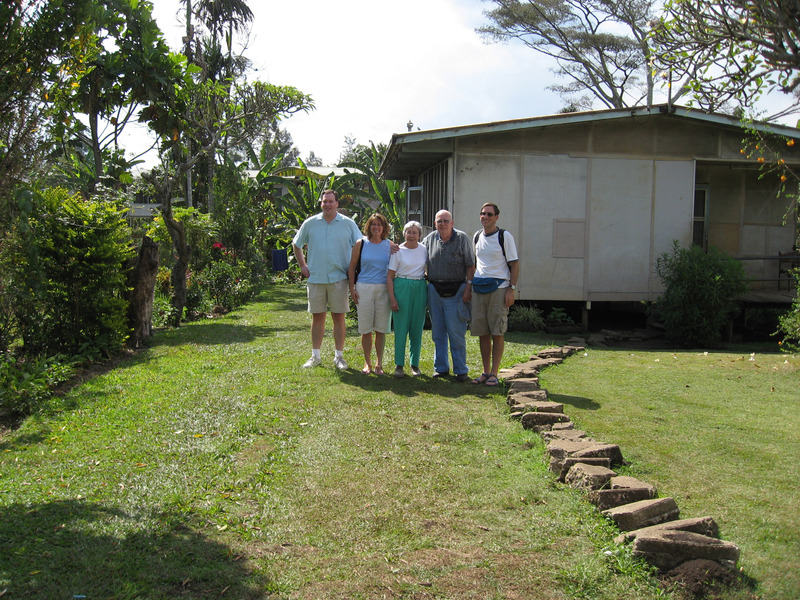 The current occupants of the house out on that same front porch 35 years after the above picture was taken. We sold the house in 1973, and they explained they bought the house in about 1986 and had lived there for the last 21 years. 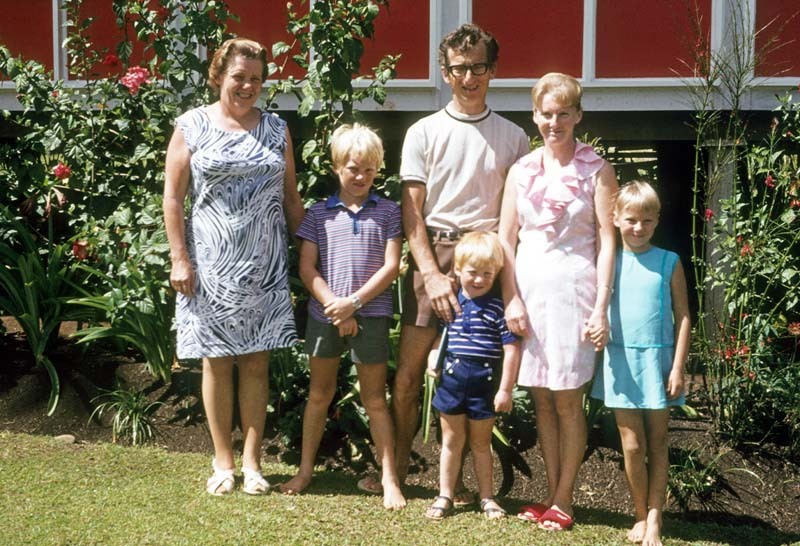 A close up of the nuclear family that lived in this house before. 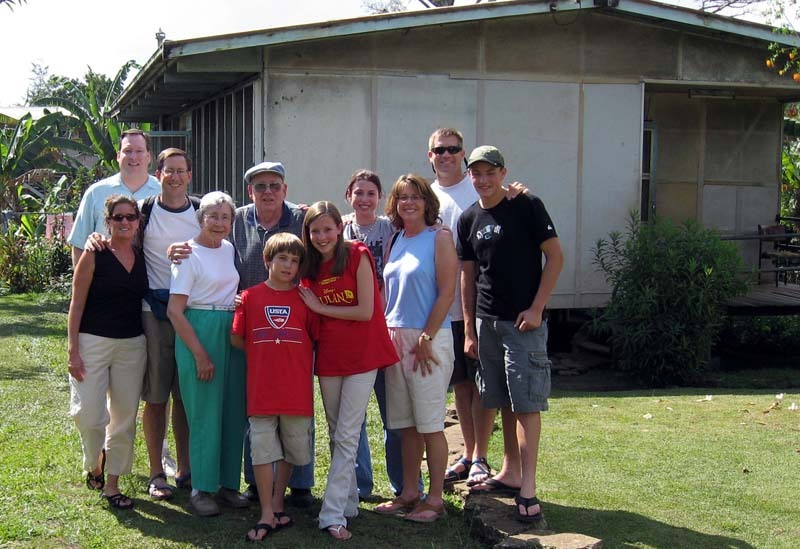 And below is all 11 of us that went on this crazy trip to Goroka. 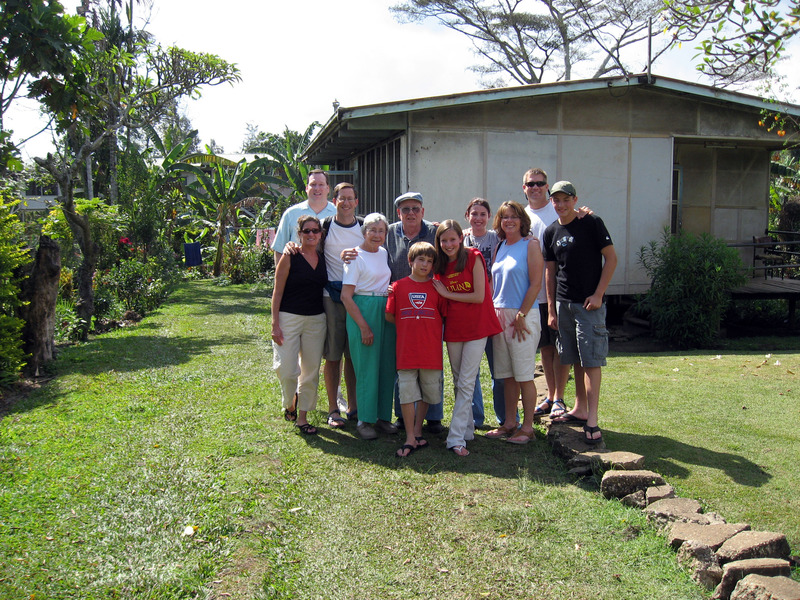 From left to right it is Ramey Echt in black, Brian Wilson in back, Randy Wilson, Virginia Wilson (Grandma) in white shirt, Howard Wilson (Grandpa) in cap, Eli Echt-Wilson (in red shirt left), Ari Echt-Wilson (in red shirt right), Catherine Grace Hoffmann, Cheryl Hoffmann, Mark Hoffmann (sunglasses in back) and on the far right in the baseball cap Nathanael Mark Hoffmann. Below is a clear picture of the side of the house now (July 29, 2008). Picture taken at the front of the house looking past towards the back yard. Below is a picture of the very back of the house. 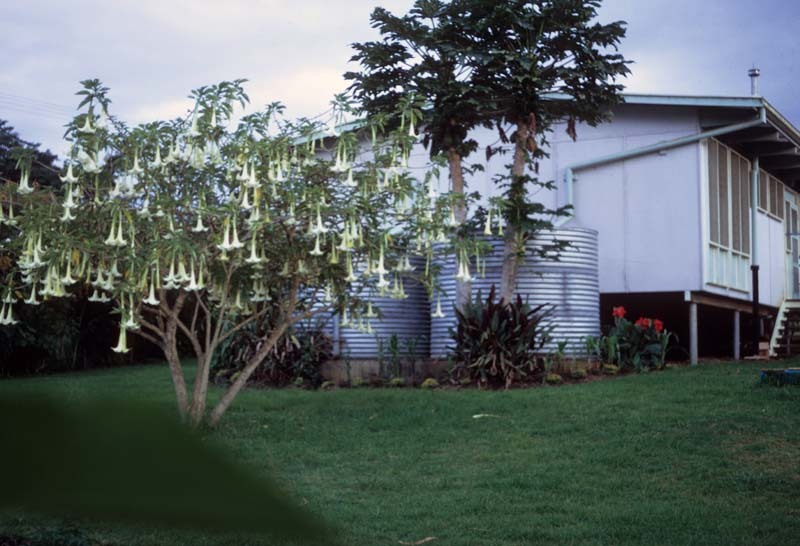 What is missing are the two large fresh water collectors that would collect run off from the roof. 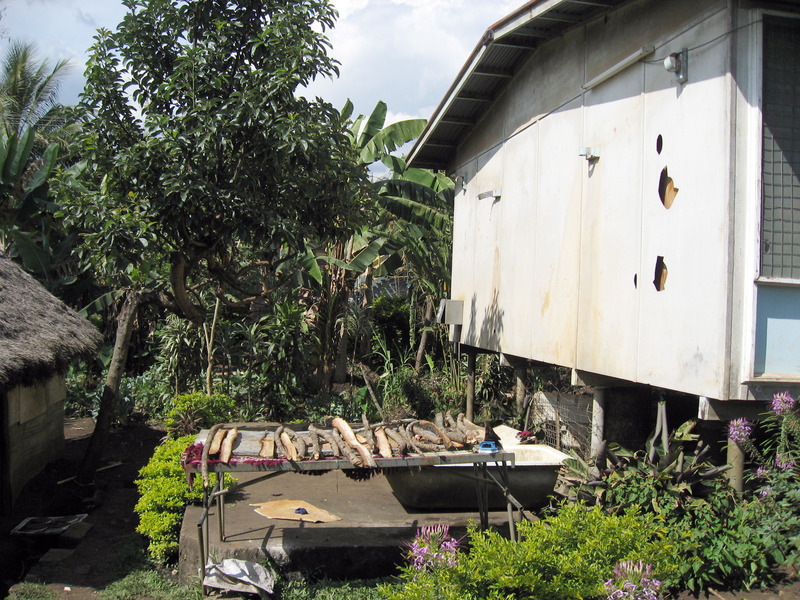 The concrete slab in the bottom of the picture used to hold those two water collectors. The picture below was taken in 1972 and shows the two water tanks in their original position on the concrete slab. A close up of the wall. Notice the two metal hooks that held the drain pipe going from the roof gutters to the water tanks are still there after 34 years, even though the big water tanks are gone. Below is a close up panorama to see the additional window security that has been added (iron grate) over the windows. A close up of the stilts on the house. 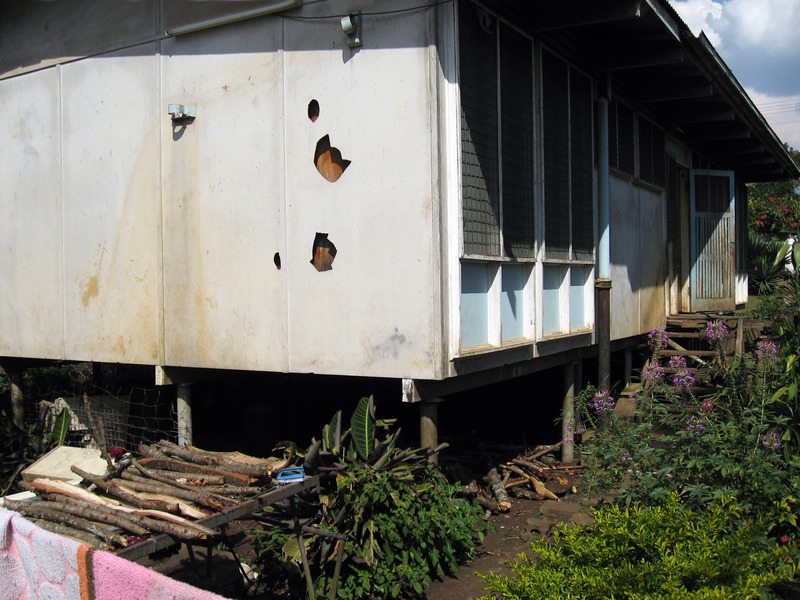 Houses EVERYWHERE in Papua New Guinea are built on stilts, I think for a couple of reasons. 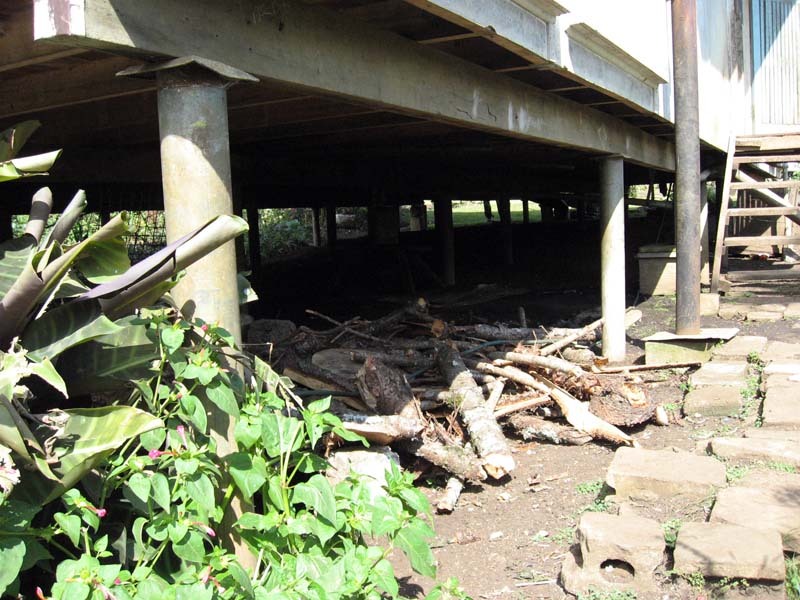 One is so you can poison the stilts and prevent bugs from crawling up into the house, another reason is for ventilation to keep the house dry and as cool as it can be (cool off at night). A picture looking up the street. The hospital is up that road and to the right. Looking down the street in front of the house (away from the hospital, our house is on the right). 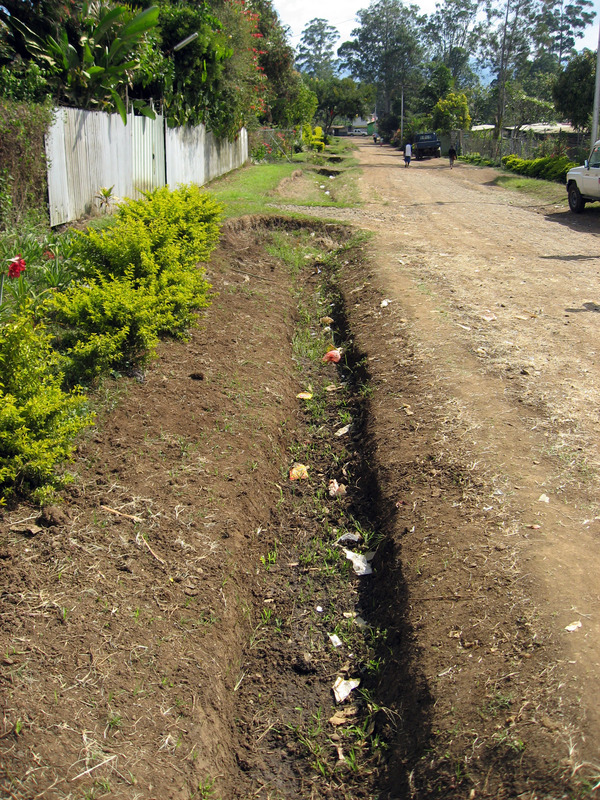 Same direction, other side of the street to see the culvert (ditch). When it rains water would RUSH down through this culvert in a wave. Our house is obscured by all the bushes. A picture of the "Davis House". The Davis family lived across the street from us in this house in 1973. 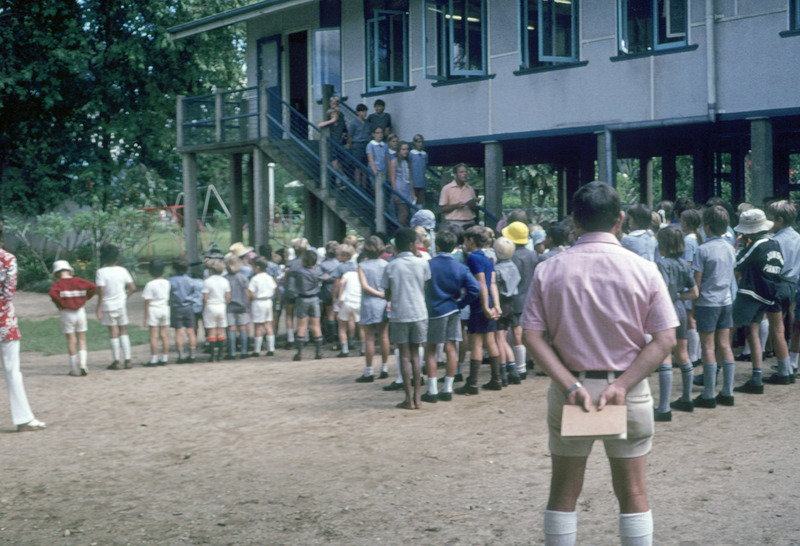 ON TO THE NEXT TOUR STOP -> The next stop is the Goroka International School where the kids (Cheryl, Randy, and Brian) attended primary school (various grades 1 through 7) in 1972. Below is Cheryl standing near her old classroom. 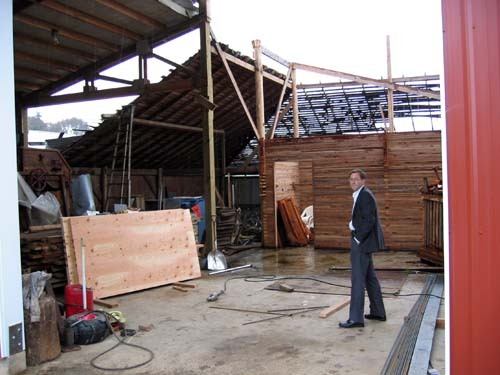 We think the building of the actual classroom has been torn down (the yellow posts might have been it's foundation). Here is a scanned picture from 1972 showing approximately the same spot. Cheryl is one of the 11 year old "monitors" on the stair case in the picture below. The picture below is current (from 2008), a close up of the stairway. A few things are different than the picture above (the windows for example), so we think it isn't the same building pictured. 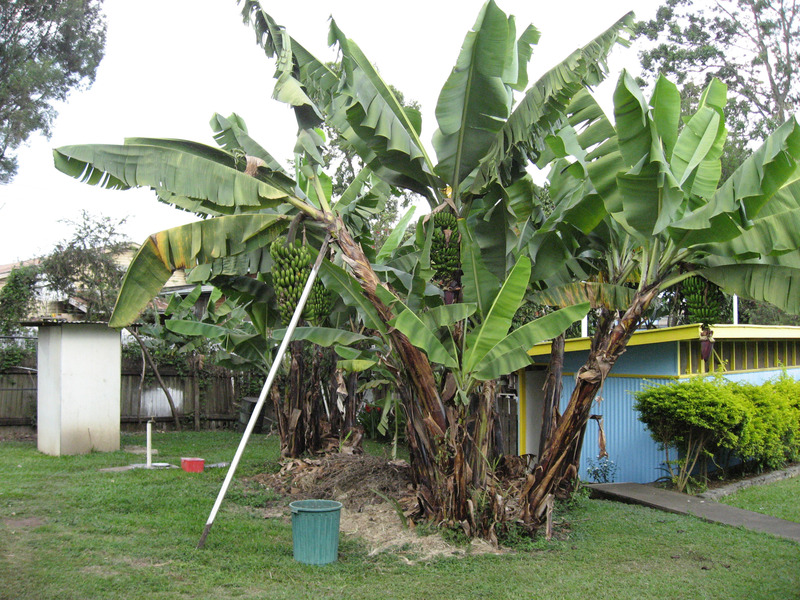 This banana tree in the school yard is so loaded with bananas it must be held up with sticks. 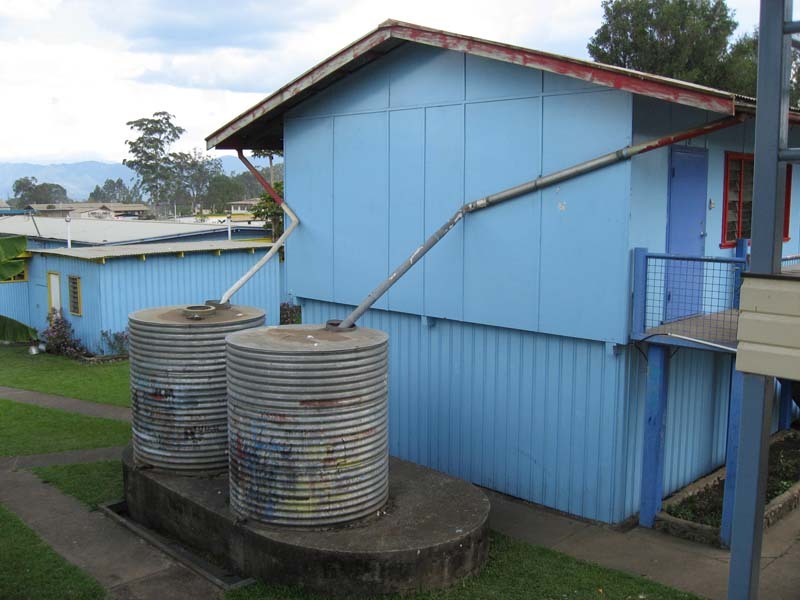 A shot of the back of the school building and that they still collect rain water in large steel tanks. 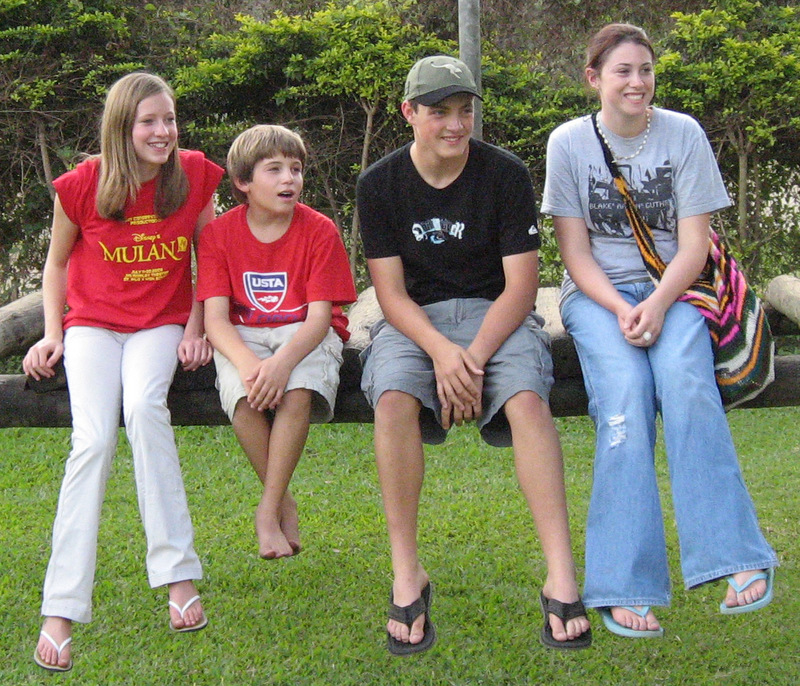 The grand children along on the trip, from left to right it is Ari, Eli, Nathanael, and Katie. Sitting where their parents went to school and played in this playground 35 years earlier. 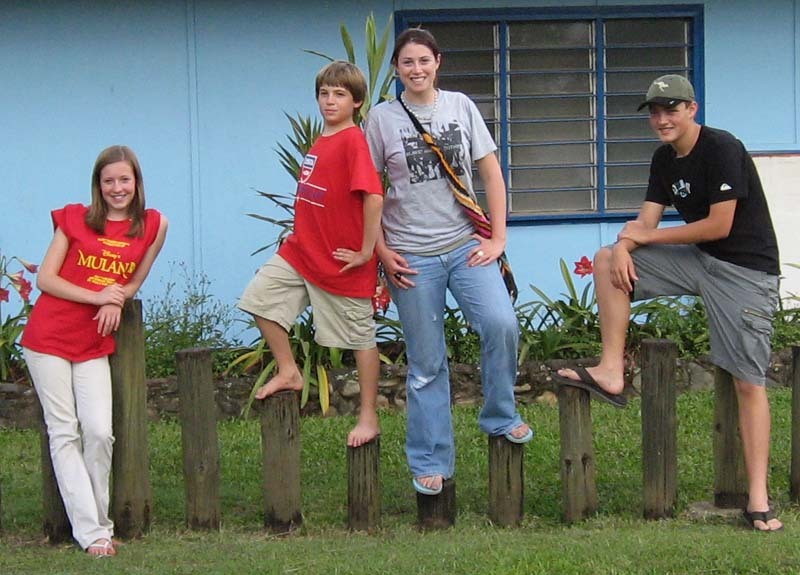 Same grand kids, different spot. 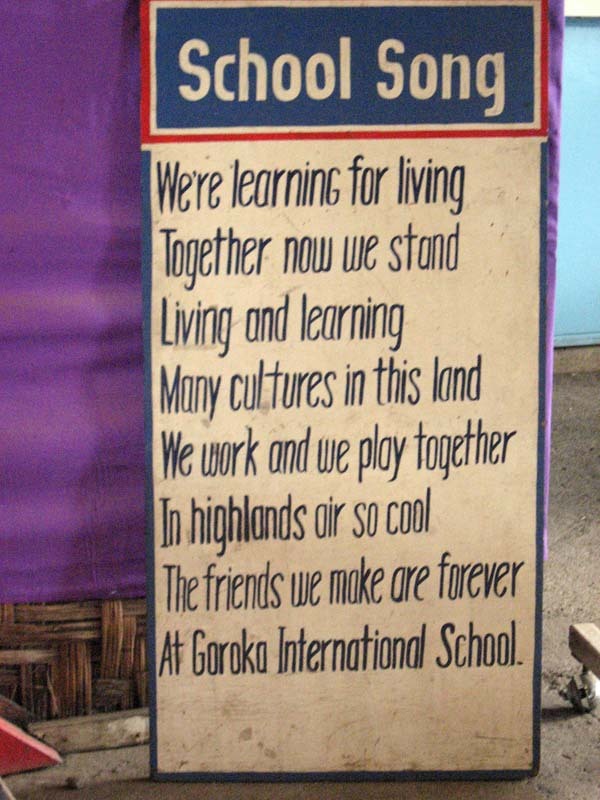 A panorama through a window of one of the Goroka International Primary school classrooms. 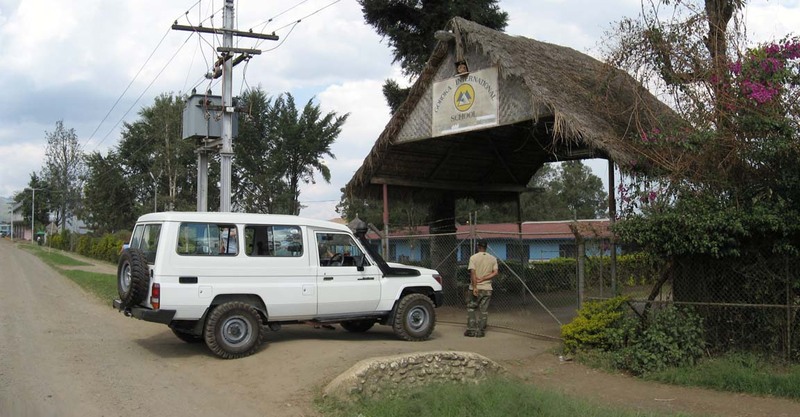 ON TO THE NEXT TOUR STOP -> the University of Goroka!! 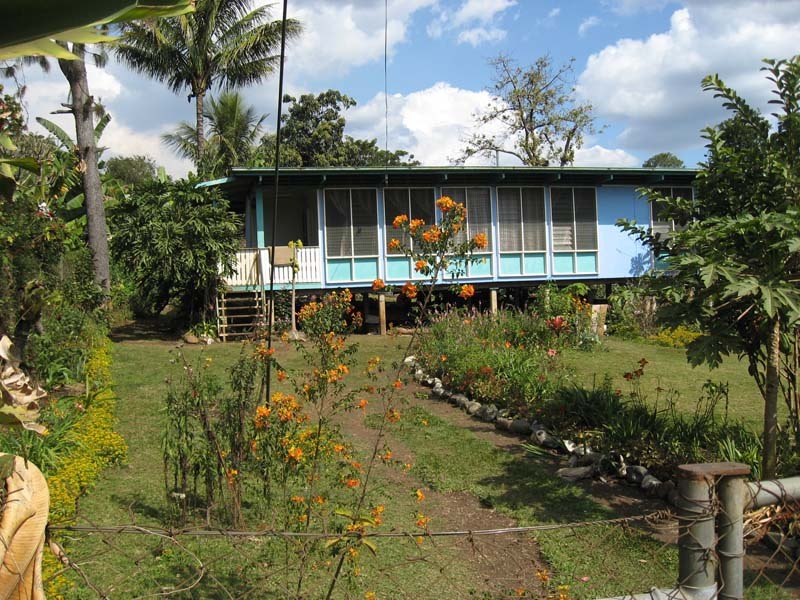 Howard (my father) was head of the mathematics department at the Goroka Teachers College in 1972 and 1973 (which became the University of Goroka later). There had been one former head of the mathematics department for 2 years before Howard arrived. 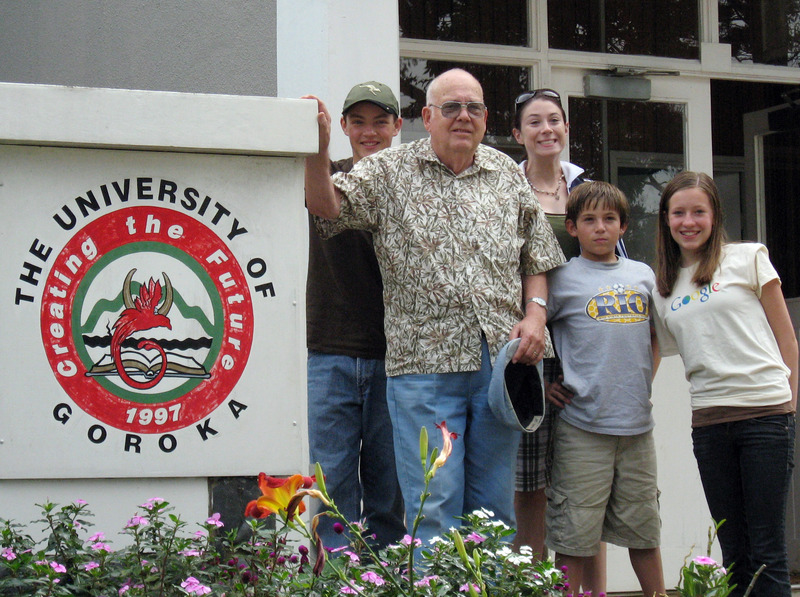 Below is Howard Wilson at the front steps of the University with his grandson Eli. Howard Wilson and all of his grand children. None of the grand kids existed when Howard was last in this spot 35 years earlier. Below is a picture out the front of University of Goroka. 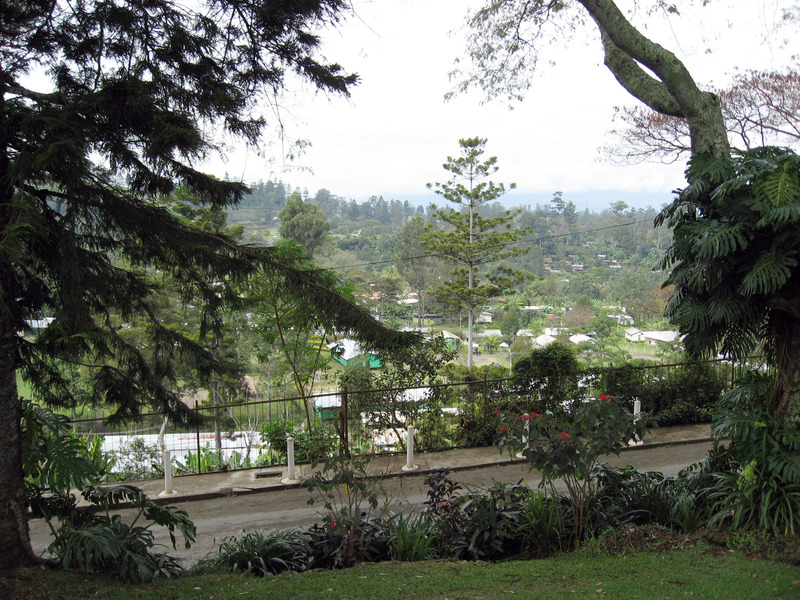 A panorama of the "Original Quad" of the Goroka Teachers College (now "University of Goroka"). Same picture as above, just a different angle from first floor center of the quad. 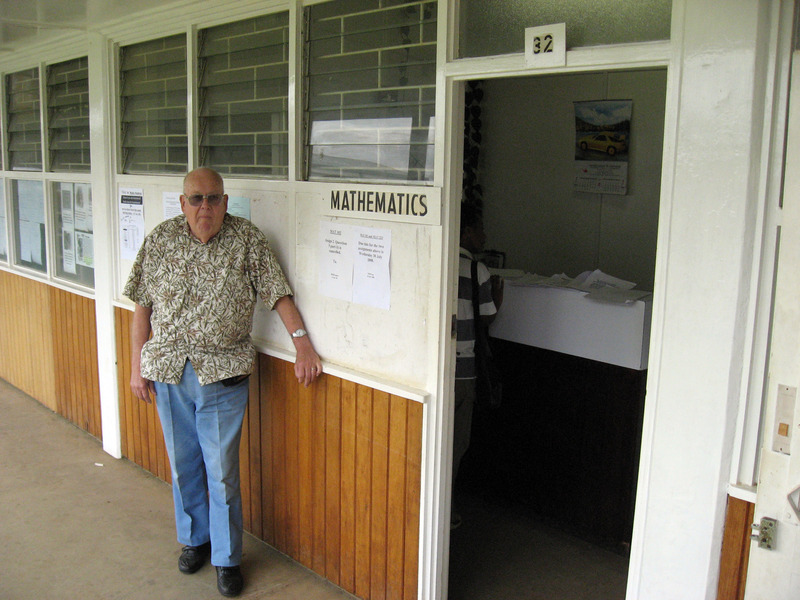 Howard Wilson standing by the entrance to the Mathematics department at University of Goroka. Howard was head of this department in 1972 and 1973. 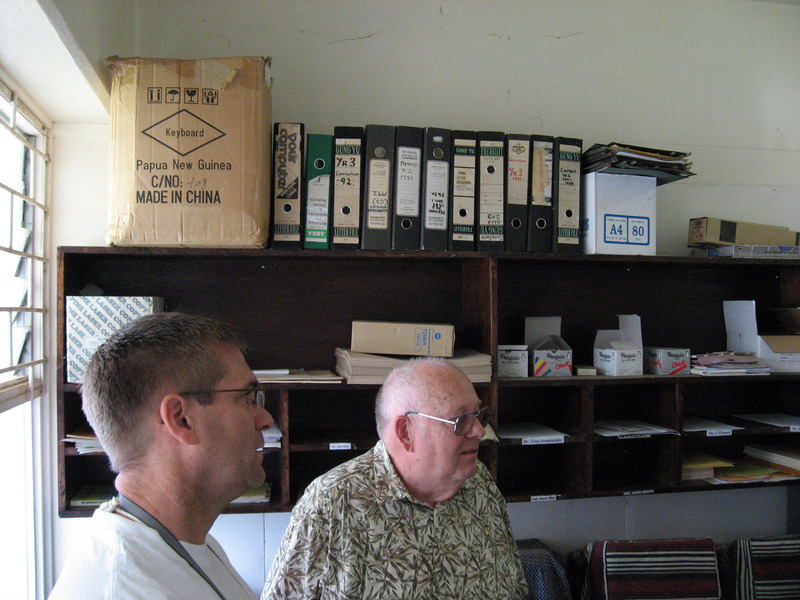 The rest of the mathematics department was in this same office in 1972. There were five faculty members including Howard. 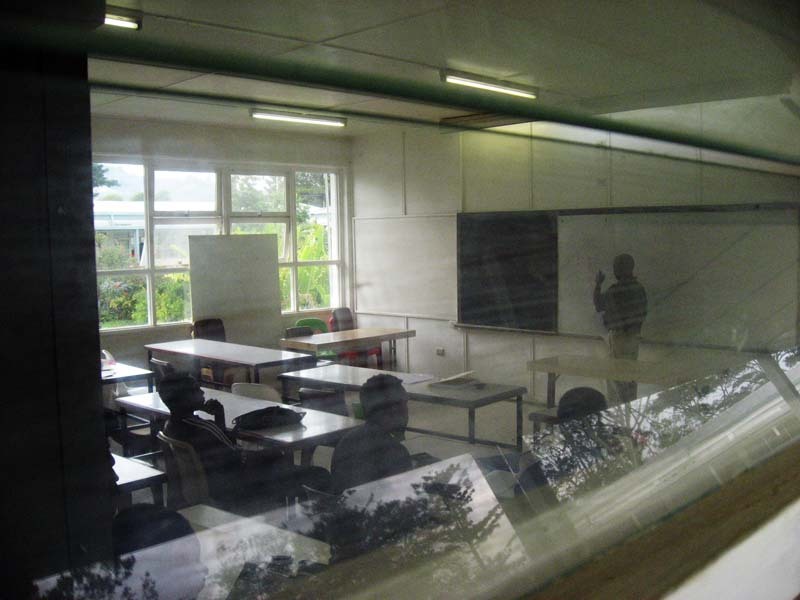 The picture below is peeking into a classroom at University of Goroka seeing the class under way. 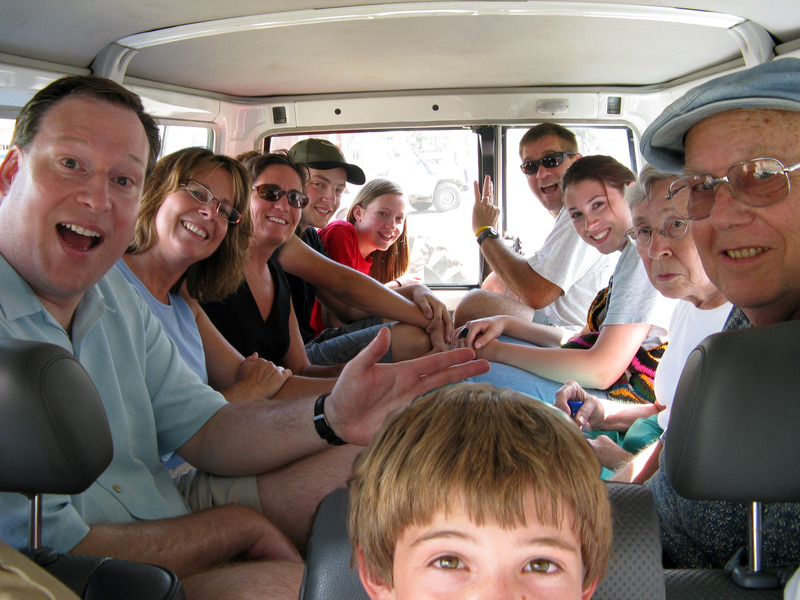 John Rupa (our driver) introduced us to Dr. Lynus Yamuna (pictured below in red shirt). Professor Lynus Yamuna (email: tamunal@uog.ac.pg) is head of the Department of Language and Literature at University of Goroka and has a PhD from the University of Pennsylvania, USA. Dr. Yamuna cleared his busy schedule and spent the next few hours giving us a very personal tour of the University with introductions. We all felt very welcome, it was extremely nice of him to take the time for our family. Below is Lynus Yamuna standing next to Howard Wilson. Howard's wife Virginia is sitting in the lower right. 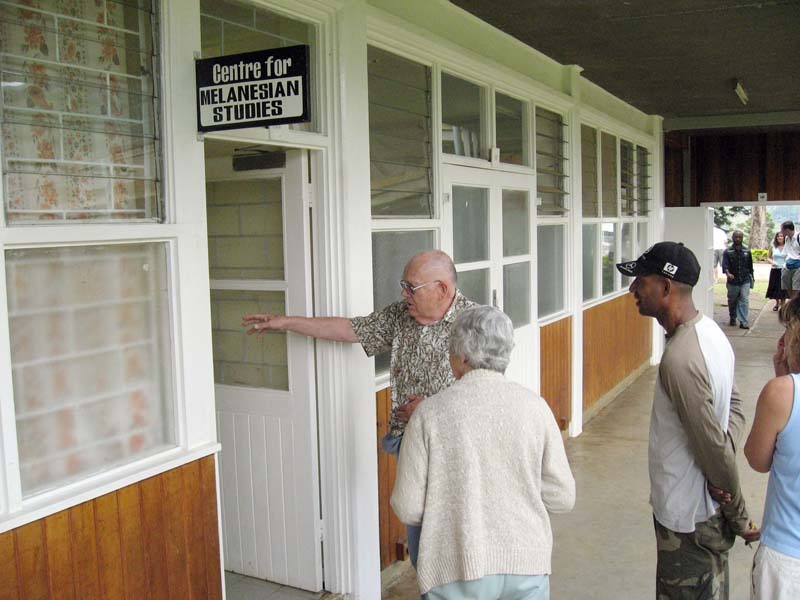 Below is Dr. Lynus Yamuna talking with Dr. Howard Wilson and the rest of our family about the progress and changes at the University of Goroka over the last 35 years since Dr. Wilson left. 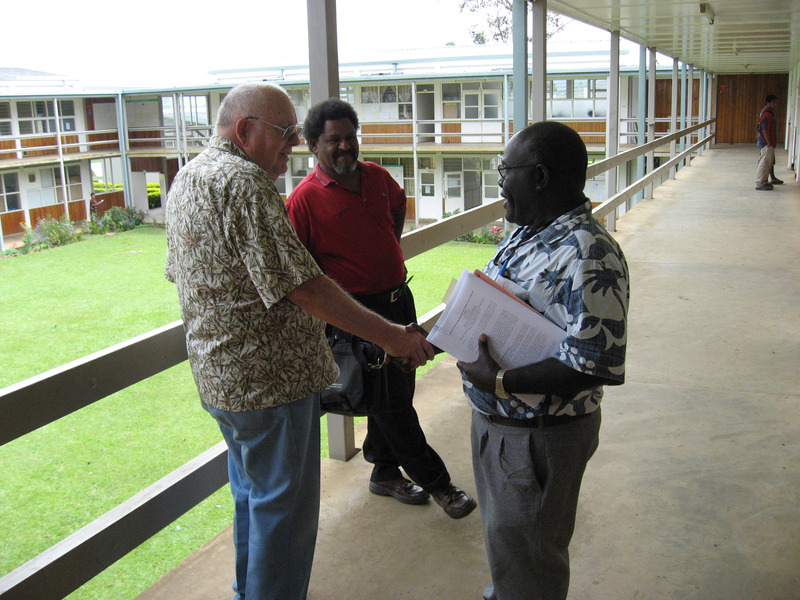 Howard Wilson shaking hands with Dr. Wilfred Kaleva (email: wilfredk@uog.au.pg) Professor Kaleva is the CURRENT head of the Department of Mathematics And Computing at University of Goroka, and Professor Wilson was the head of the Mathematics department back in 1972 and 1973 when it was called the "Goroka Teachers College". Dr. Lynus Yamuna (in red) made the introduction. 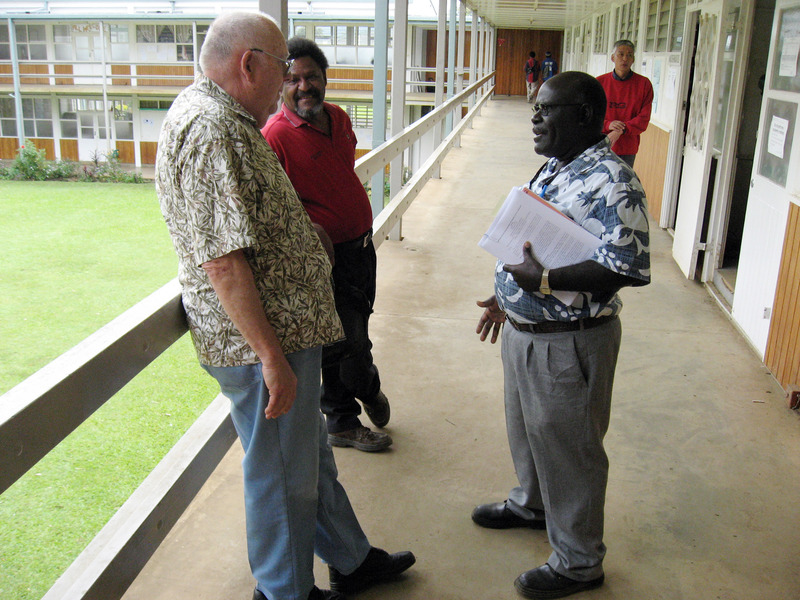 Their conversation continued for quite some time catching up on changes and curriculum at the University of Goroka. Dr. Yamuna also introduced Dr. Wilson to ?unknown? 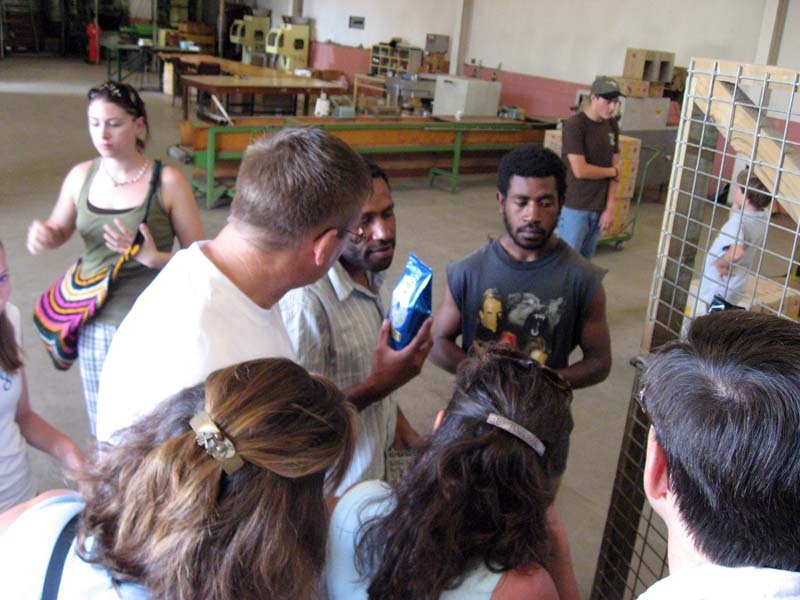 pictured in the blue shirt below. As Lynus Yamuna showed us around, that's Mark Hoffmann on the left and Howard Wilson. Notice the computer keyboard box in the upper left corner of the picture. 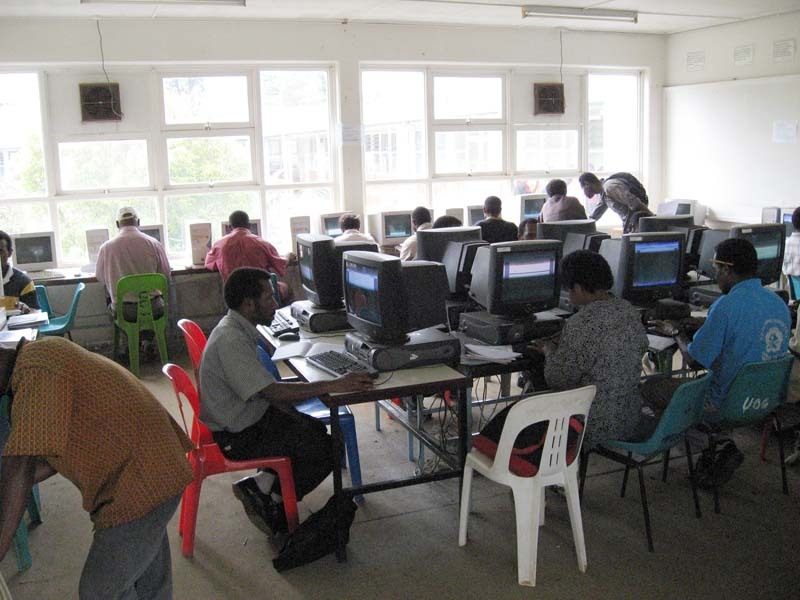 Below is a picture of students all working in the UOG-ICT Department computer lab. 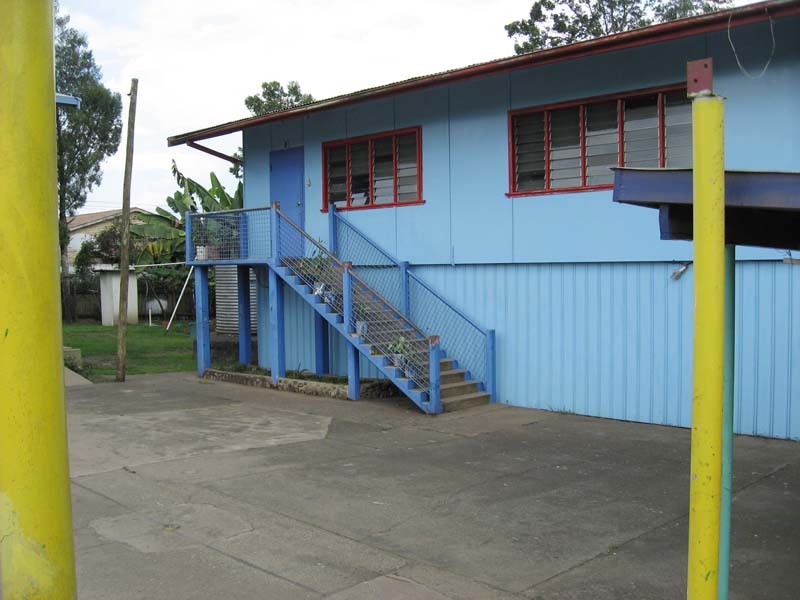 The phrase UOG-ICT stands for "University Of Goroka - Information and Communication Technologies". 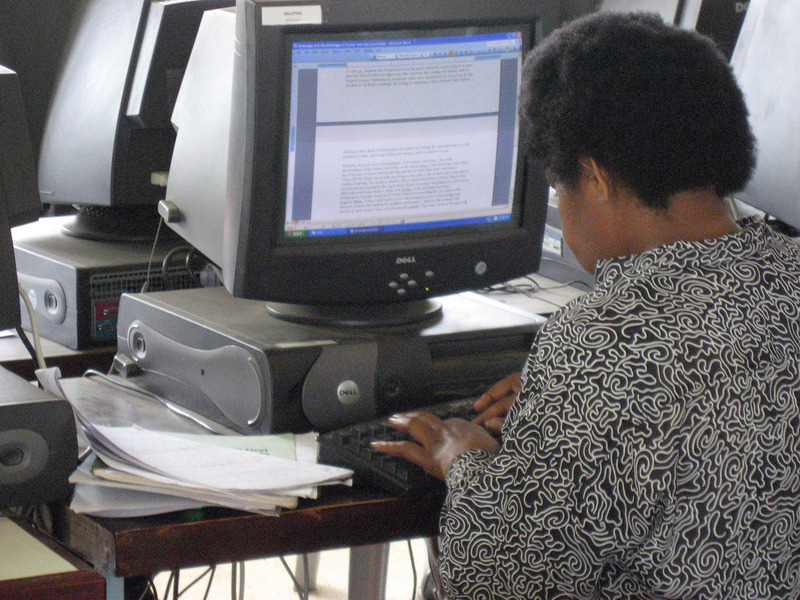 Below is a close up of a student at University of Goroka working on a Dell computer. I think that's Microsoft Word she's working in, maybe her PhD dissertation? 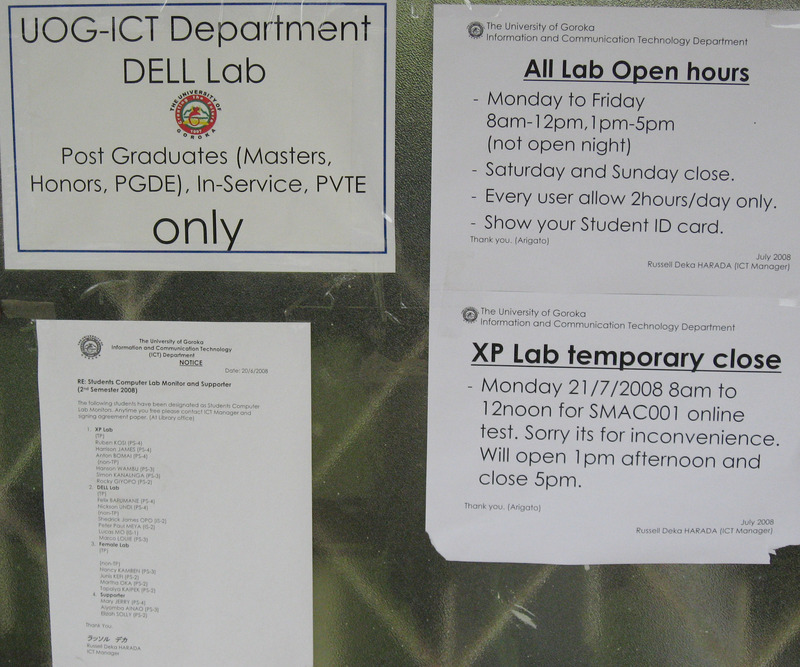 The flyer on the door to the UOG-ICT (University of Goroka - Information and Communication Technology) computer lab. A little way down the wall are some advertisements for used computers in Goroka, Papua New Guinea. The price of $1,300 PNG Kina is about $500 USD, which isn't a great price for these computers (probably a factor of 2 overpriced). 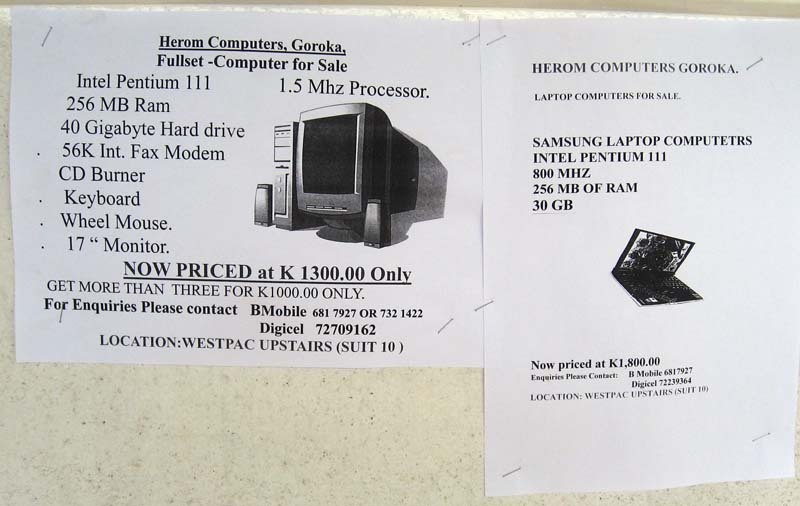 It's nice that computers are so established there is a used computer market in Goroka. 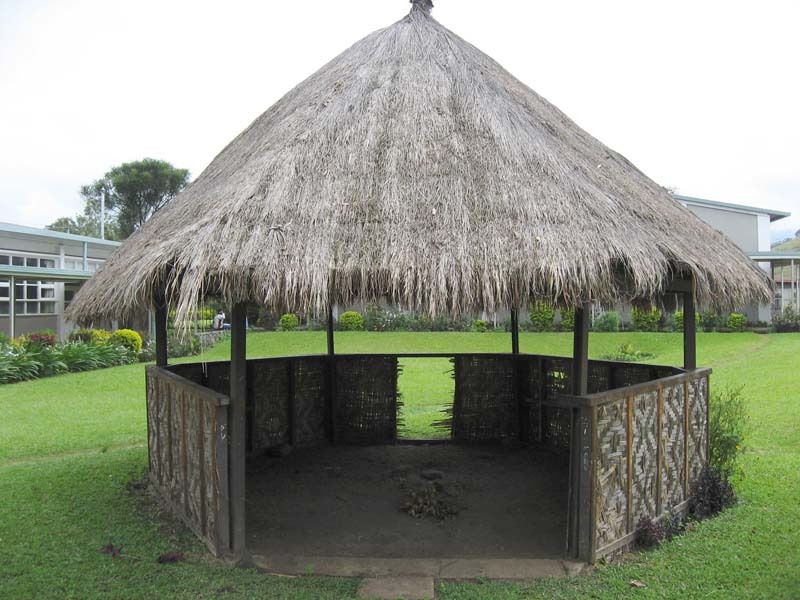 The University of Goroka has a traditional Papua New Guinea "Mumu Pit" which is an oven made from a hole in the ground and some stones. Usually when you use the word "Mumu" you mean for a party or celebration and the term means both the food and the pit all together. Most Mumu Pit celebration meals would be based on roast pig and some vegetables. 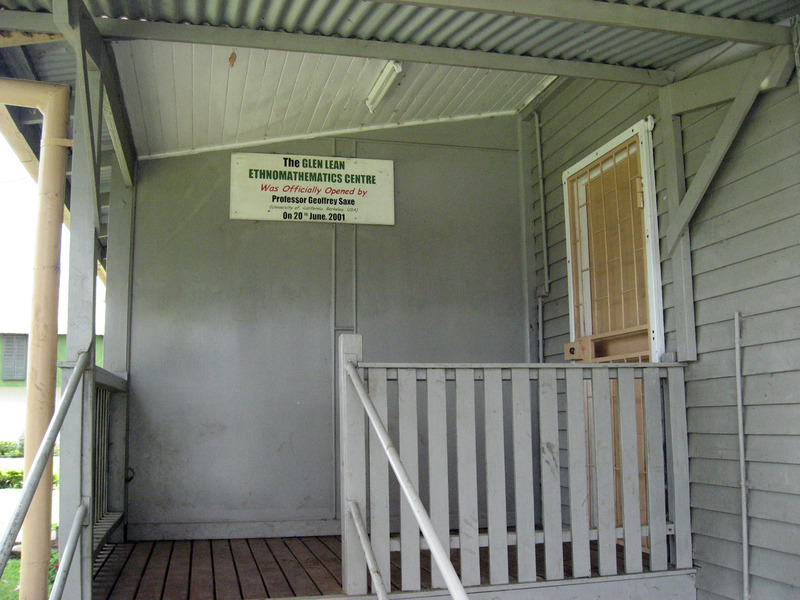 The grass hut near the Mumu Pit at the University of Goroka, Papua New Guinea. 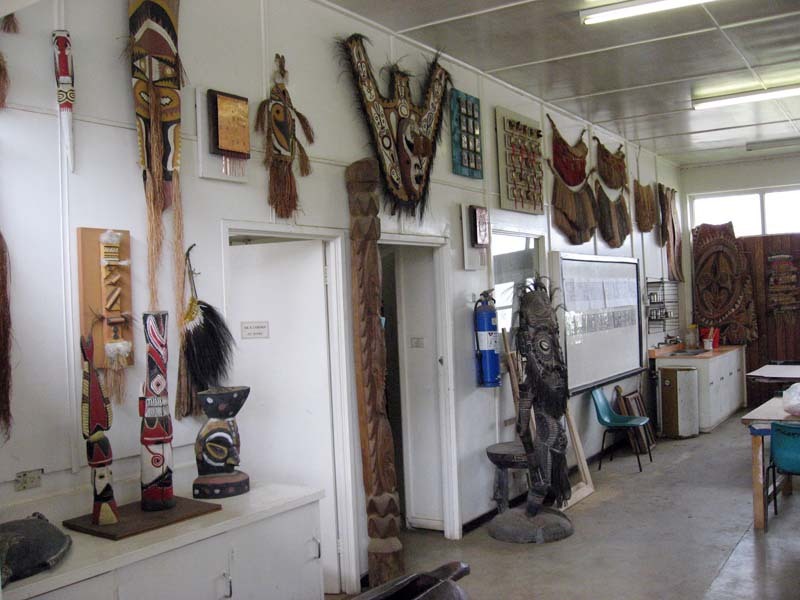 A quick peek inside the University of Goroka "Expressive Arts and Religious Education Department" front office shows an assortment of highlands and Papua New Guinea artwork. 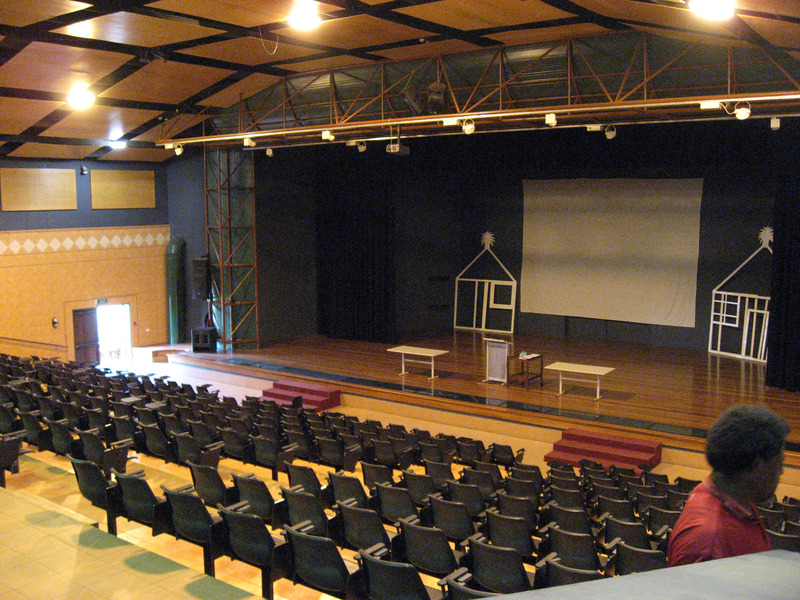 The picture below shows the University of Goroka's new Library and Mark J.Solon Auditorium. These are VERY nice new facilities recently built for tens of millions of dollars. 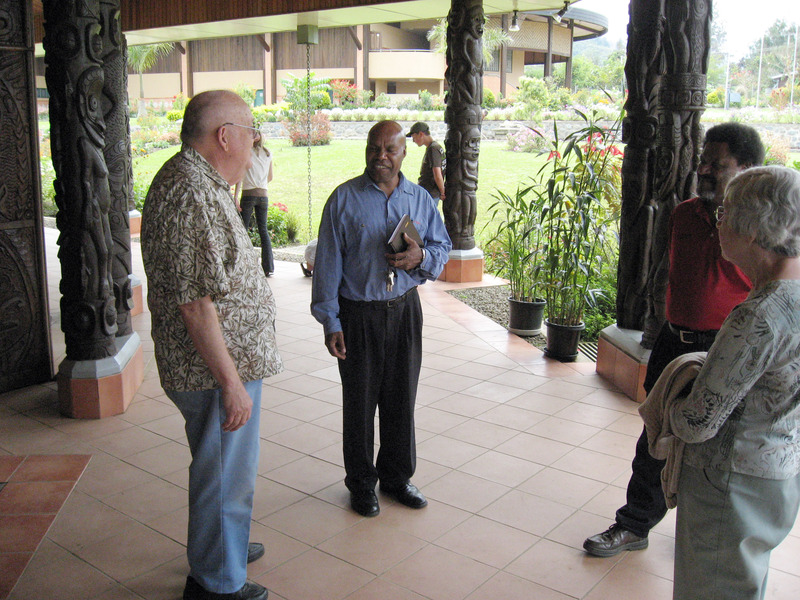 It was nice to see the progress and buildup of the University of Goroka. 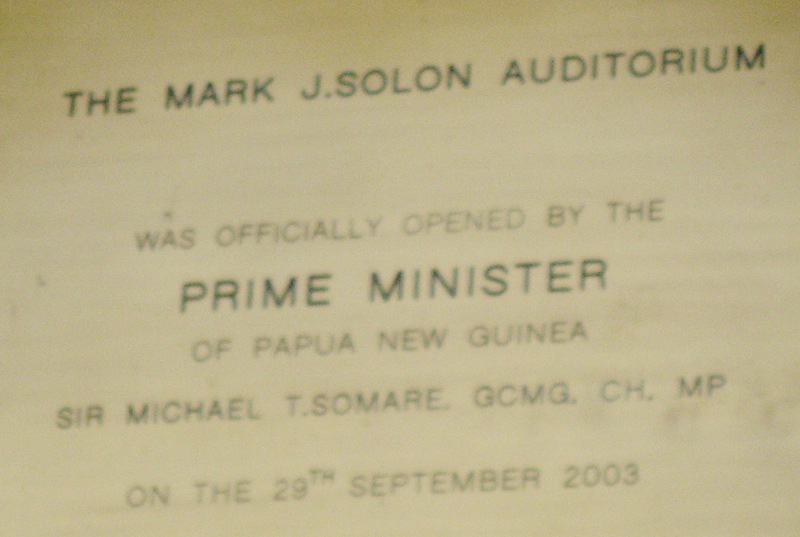 A picture of the plaque outside the Auditorium saying, "The Mark J. Solon Auditorium was officially opened by the prime minister of Papua New Guinea Sir Michael T. Somare. GCMG, CH, MP on the 29th of September 2003"
A picture of the inside of the auditorium at University of Goroka. It is very nice. 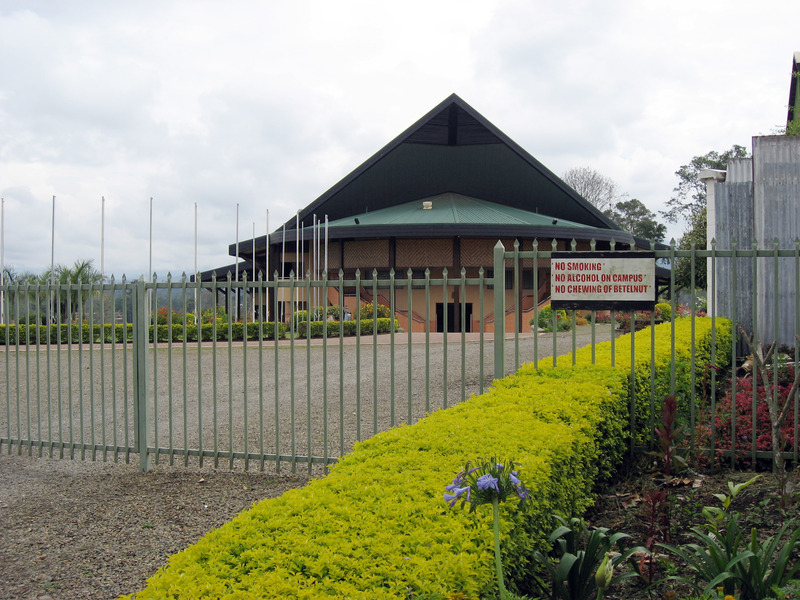 The entrance to the library at University of Goroka. 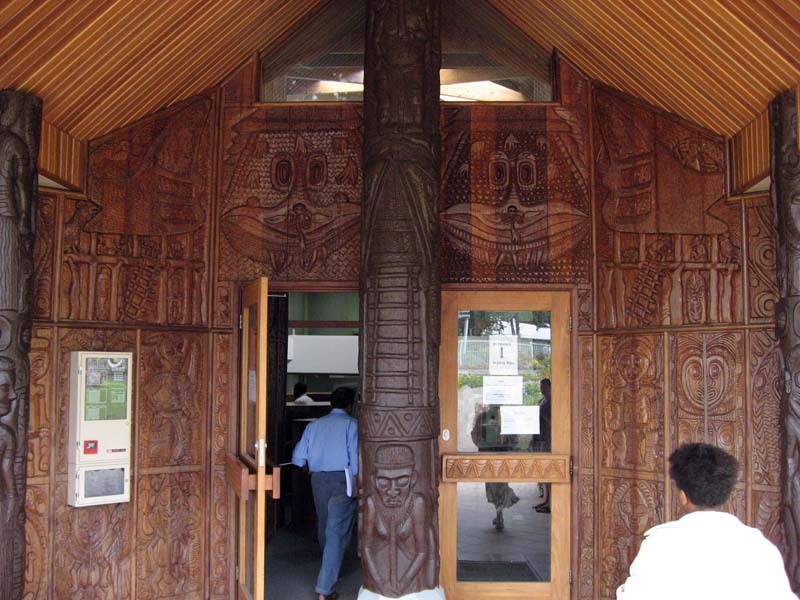 It is carved with traditional Papua New Guinea carvings and decorative poles. 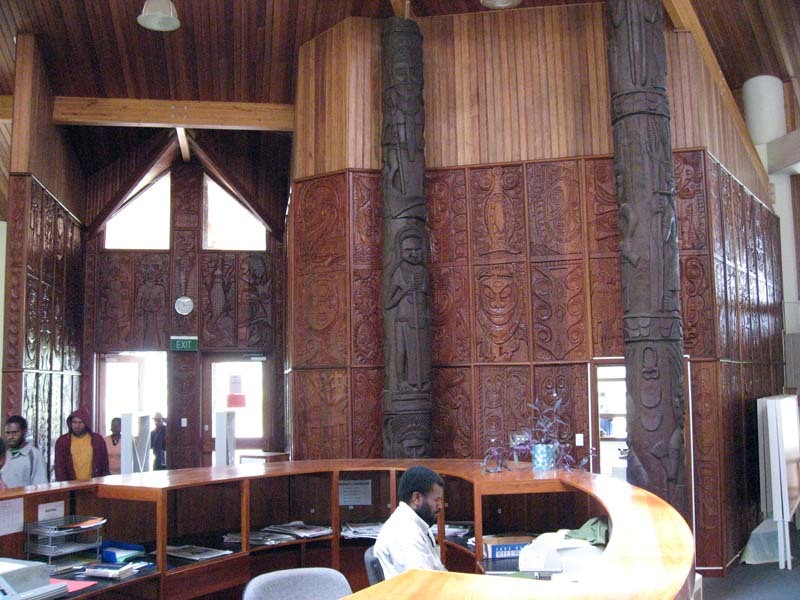 The inside of the entrance of the library at University of Goroka. 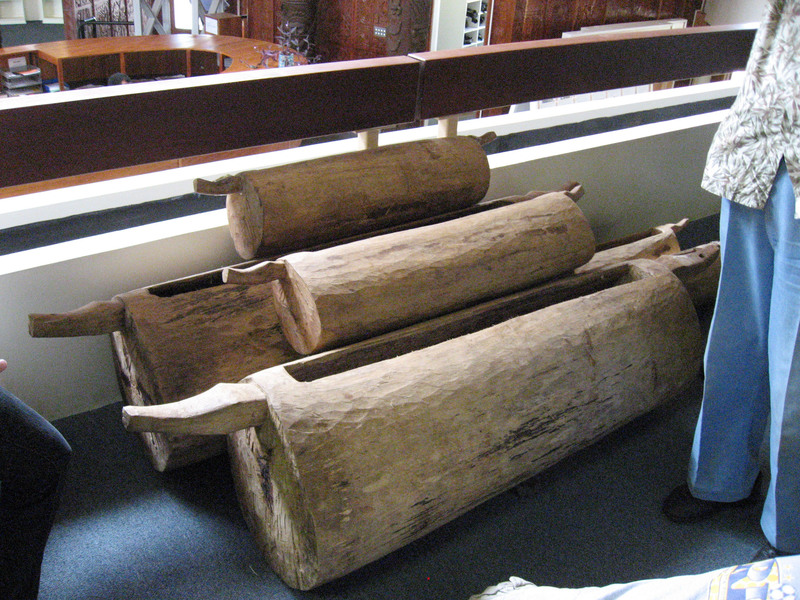 It is ALSO carved with traditional Papua New Guinea carvings and decorative poles. 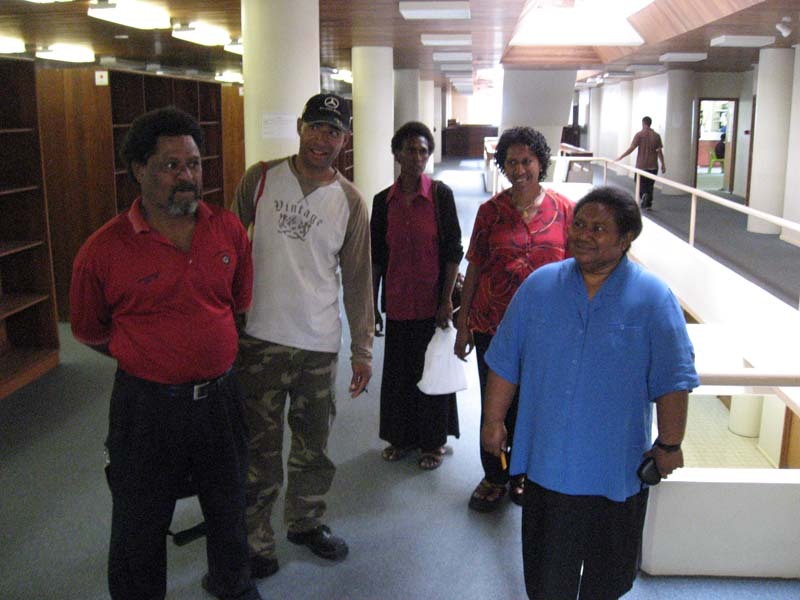 Dr. Lynus Yamuna (in red), John Rupa, and three of the librarians. The woman on the far right (?name?) in blue is the head librarian at the University of Goroka. Below is a display in the library of traditional Papua New Guinea "Slit Gong Log Drums" (also called "Garamut Drums". These drums are very deep and resonant and were used in Papua New Guinea to communicate between villages and over long distances. The sound that comes out of the drums below when you thump them with your knuckle or another piece of wood. 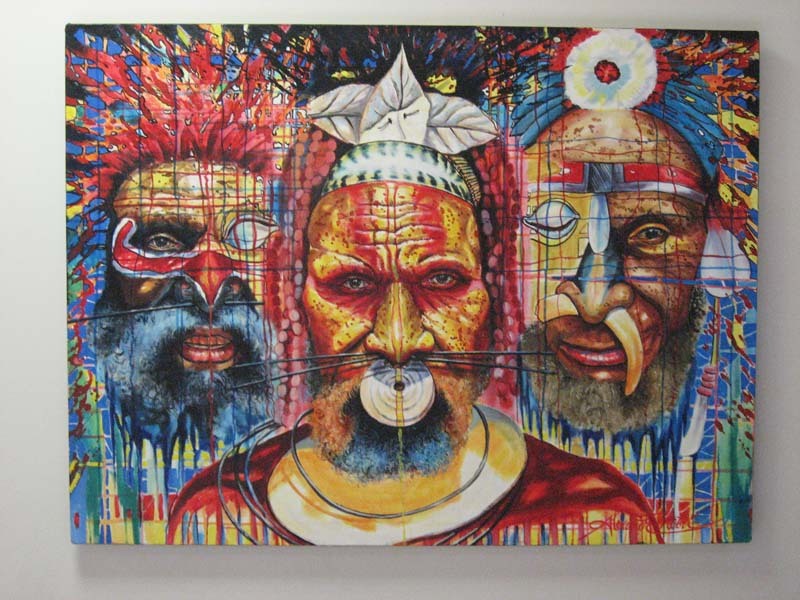 Below is a picture of art that is hanging in University of Goroka's Library in Papua New Guinea. 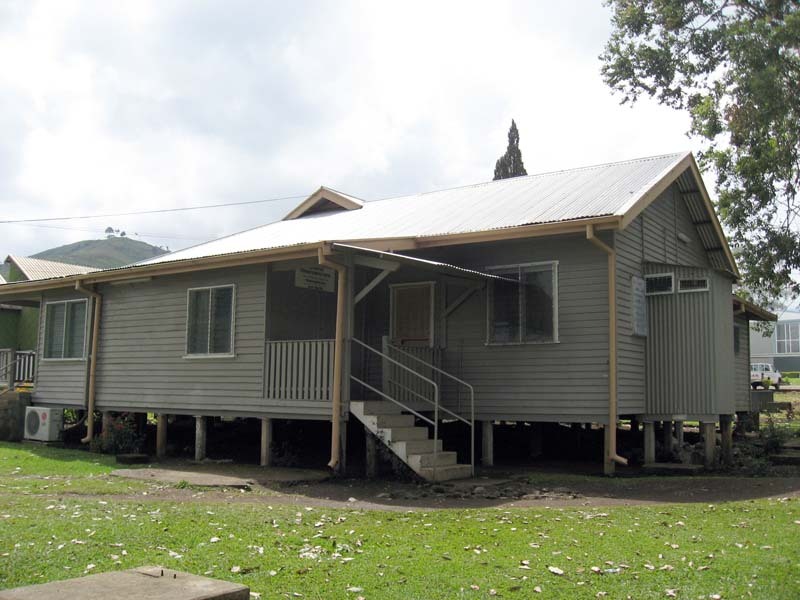 A stand alone house at the University of Goroka houses the "Glen Lean Ethnomathematics Centre" (referred to as GLEC). 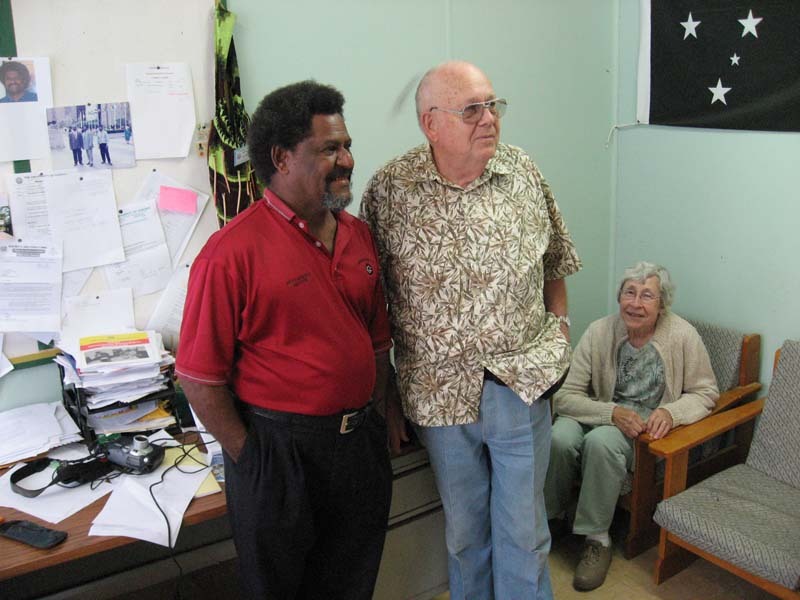 GLEC was created in the year 2000, and it's charter is to "...identify and collect data through research on mathematical practices found in the cultural context in PNG." 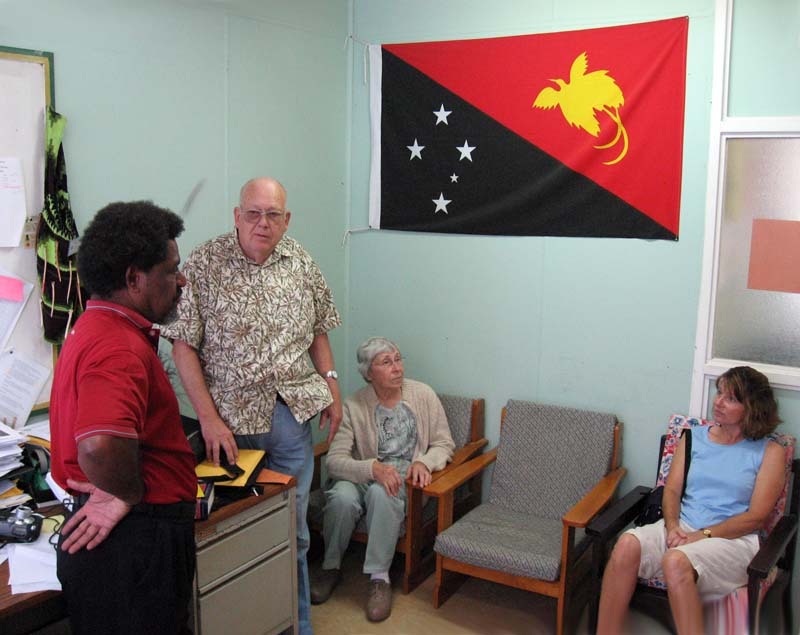 Their website mentions it is named after "Glendon Avedon Lean" who did a lot of work on language and counting systems in Papua New Guinea. 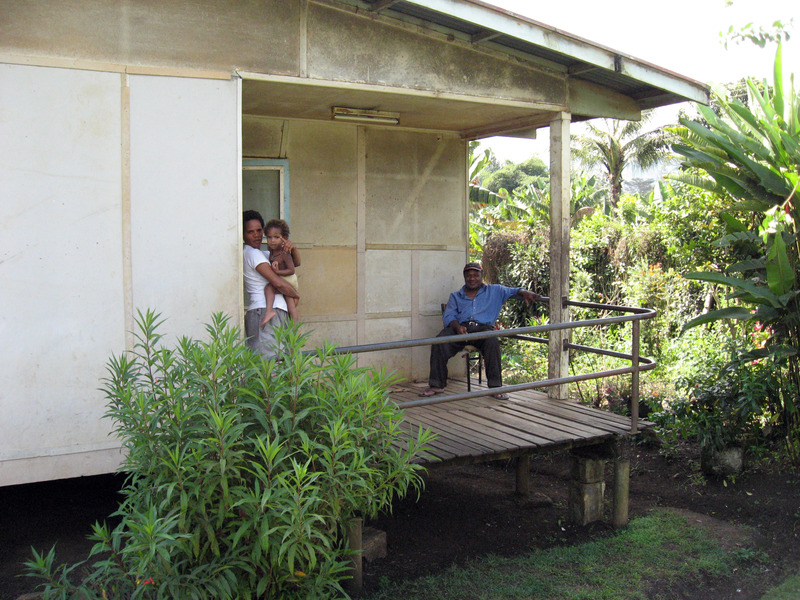 Glendon Lean identified 900 different counting systems in Papua New Guinea. ON TO THE NEXT TOUR STOP -> A coffee factory! 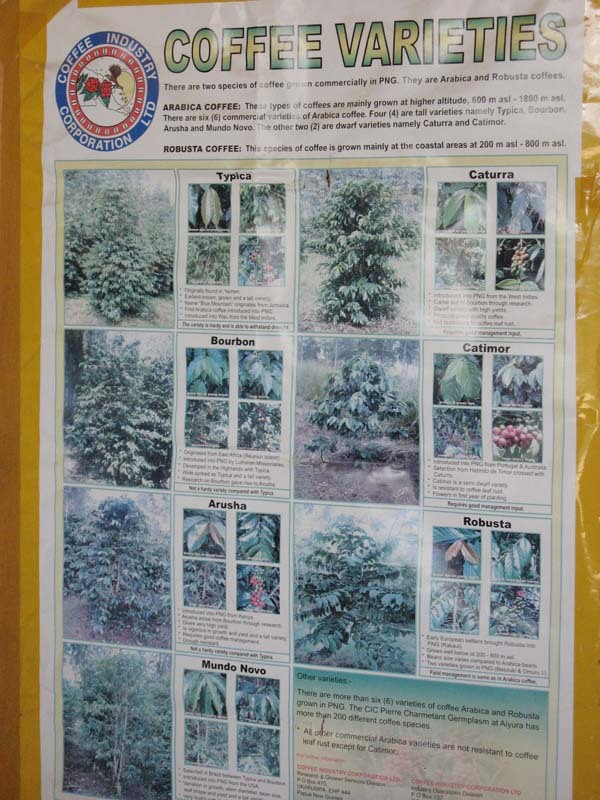 Coffee has become big business in the Papua New Guinea Highlands, and around Goroka in particular. 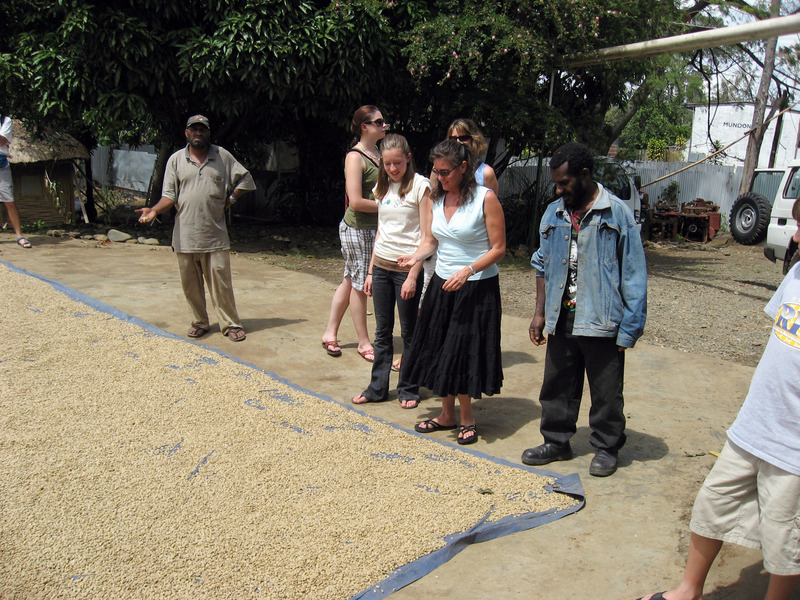 We took a quick informal tour of the Arabicas Coffee Factory just outside of Goroka (near the airport). 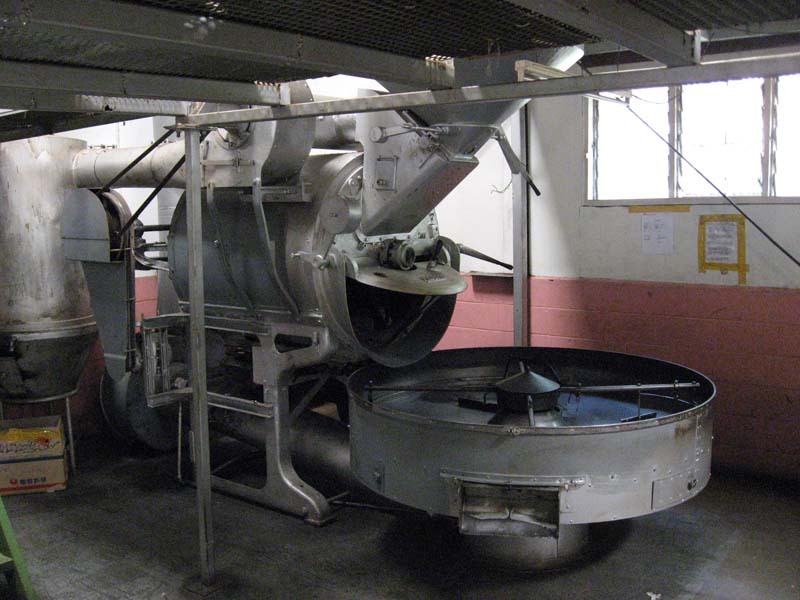 This factory buys small amounts of coffee beans from local growers, piles them together, cleans them, dries them, then roasts them, and exports them to places such as Starbucks Coffee in the USA. 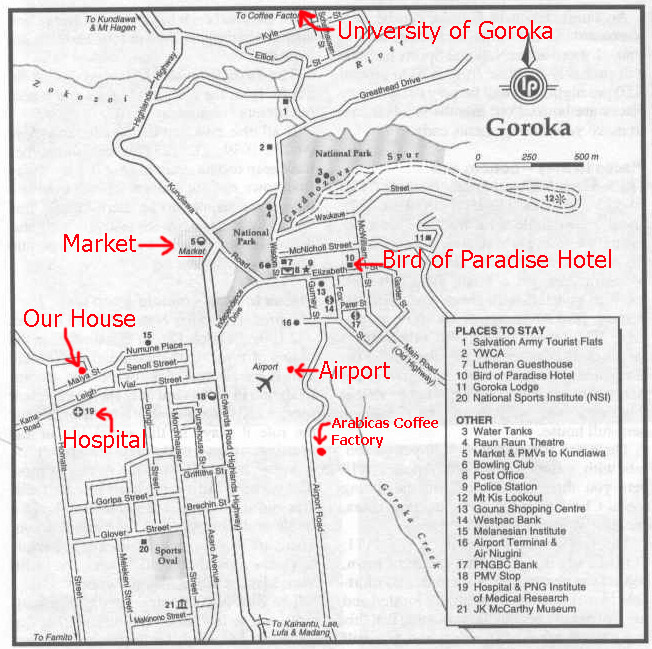 I had local Goroka coffee every morning on our trip here and it is EXCELLENT coffee!! 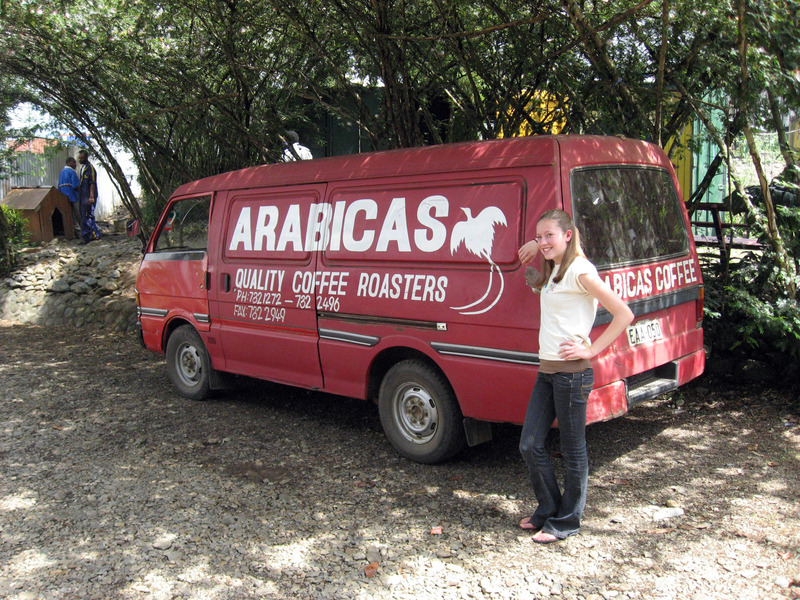 Below is Ari mugging for the camera by the Arabicas delivery van. 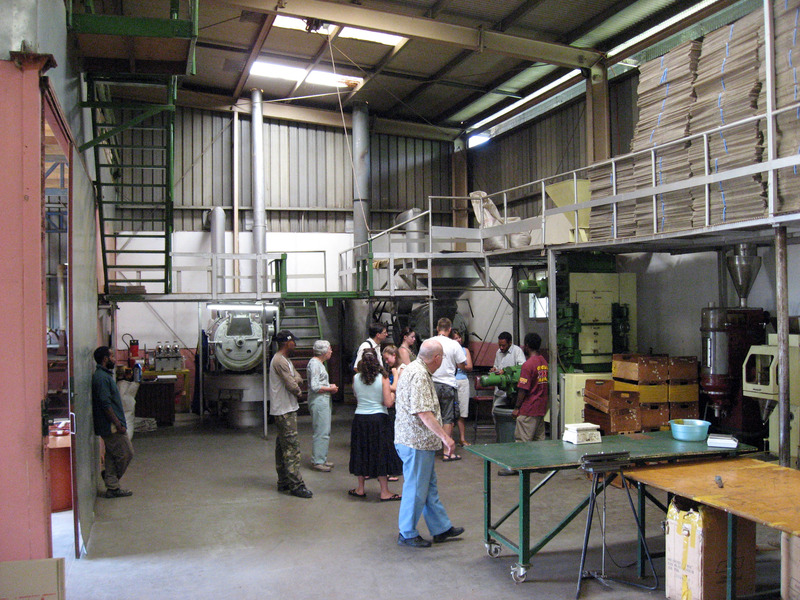 A panorama looking from the inside out of the coffee factory. Coffee is spread outside to dry here on this big tarp. 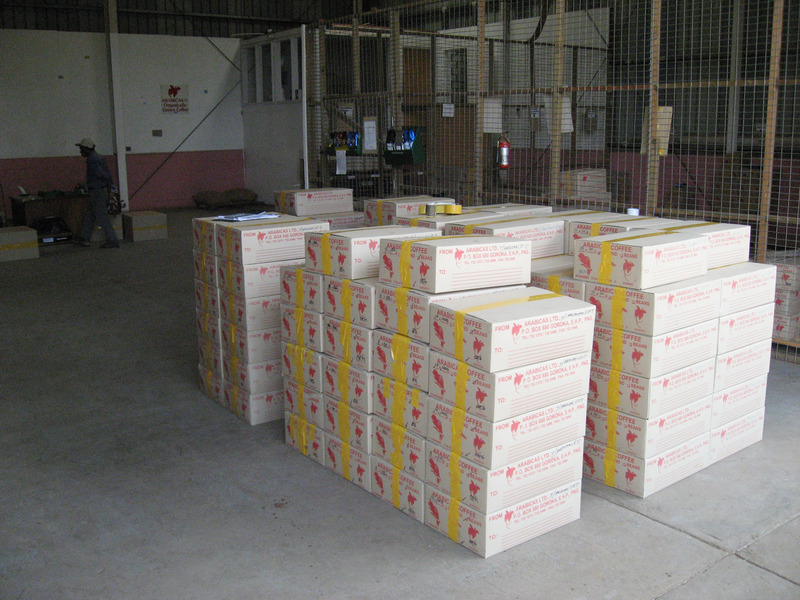 These crates of coffee are all ready to ship. We bought a couple bags of coffee from this little menu. 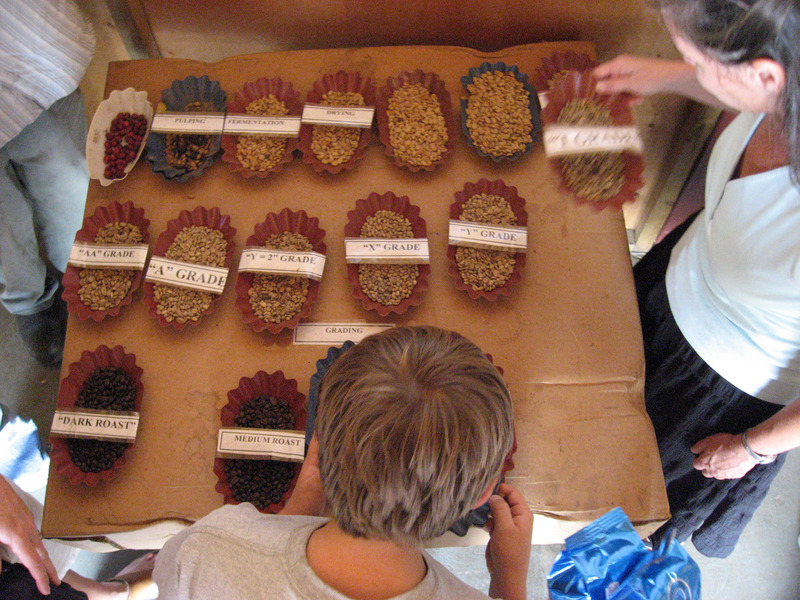 The local owners explaining the different blends of coffee they have for sale. 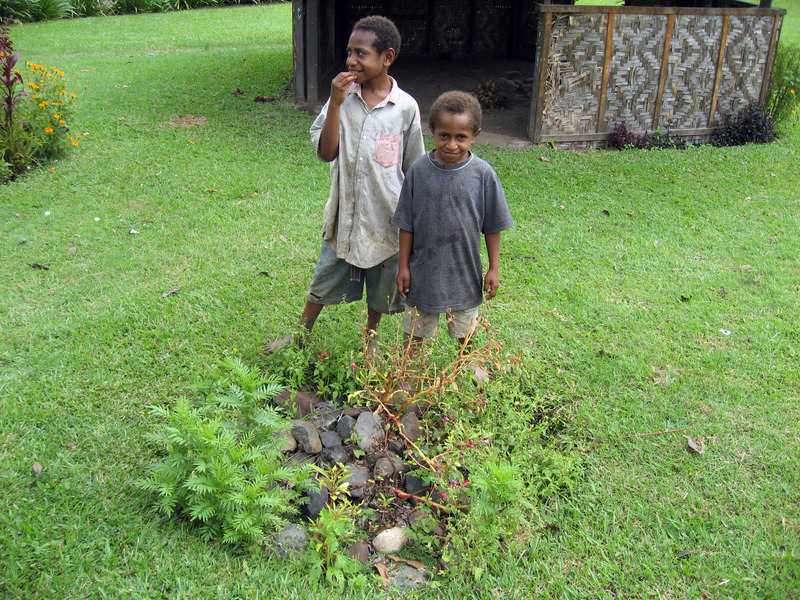 We saw these same guys a couple days earlier on the street across from the Goroka Market buying from local growers. 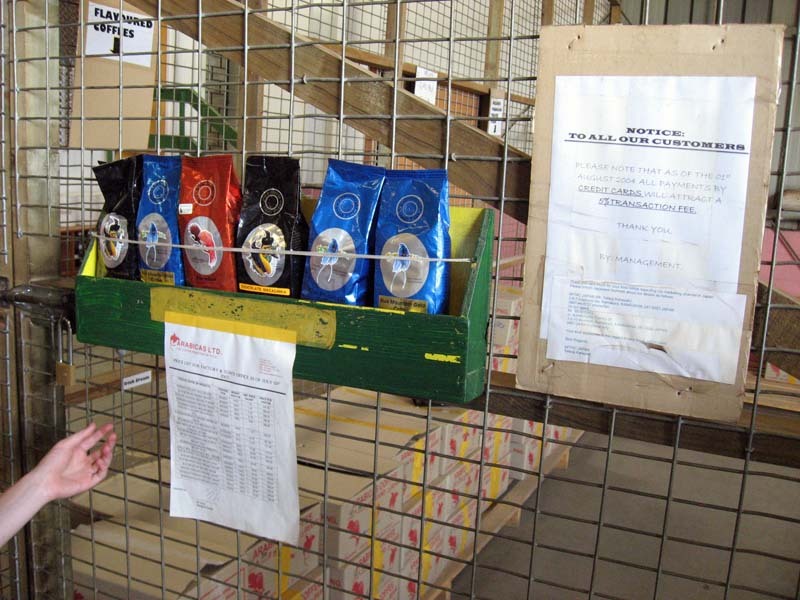 They had a display out so we could see various "grades of coffee" that they sort the coffee into here in Goroka, Papua New Guinea. A random poster about "Coffee Varieties" on the wall in this Goroka coffee factory in Papua New Guinea. 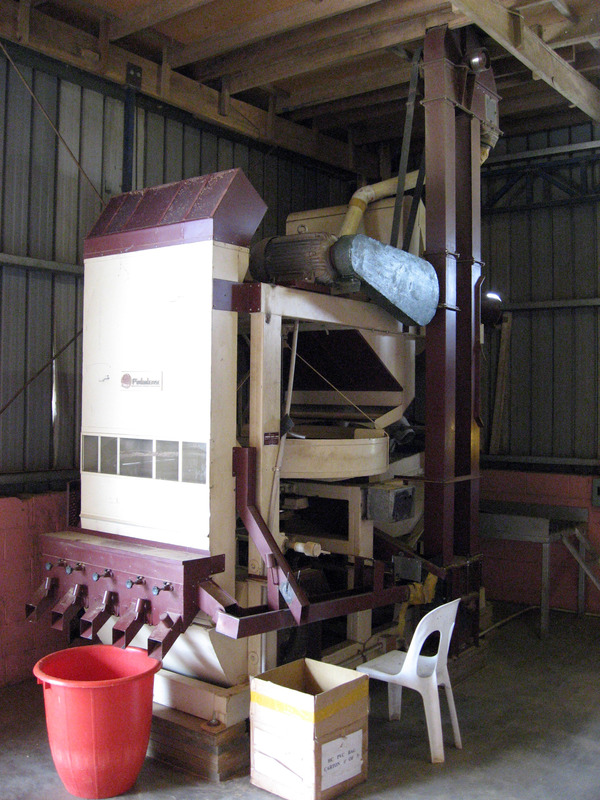 This is a coffee bean cleaner and sorter which takes out the chaff and impurities from the beans. My grandfather (Ralph Wilson) for years grew grass seed in Salem Oregon, and these look almost identical to our family grass seed cleaner. 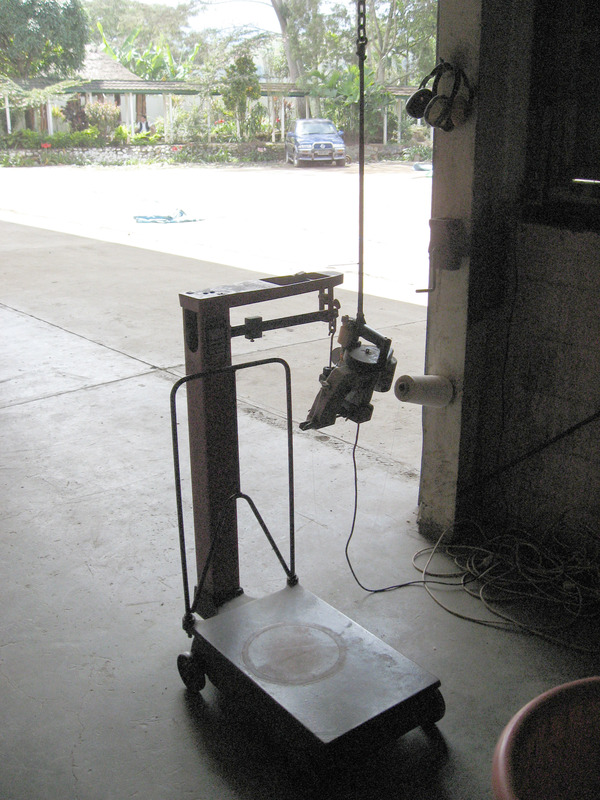 Much like our family owned grass seed business, they have a scale to weigh bags, and a sewing machine to sew the bags up. 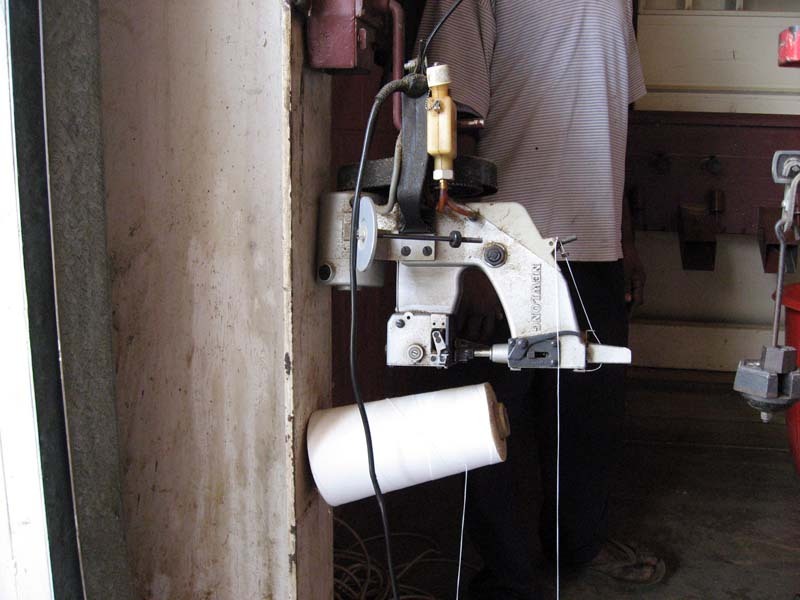 A close up of the sewing machine that sews the coffee bags up. These are BIG coffee bags (160 pounds). 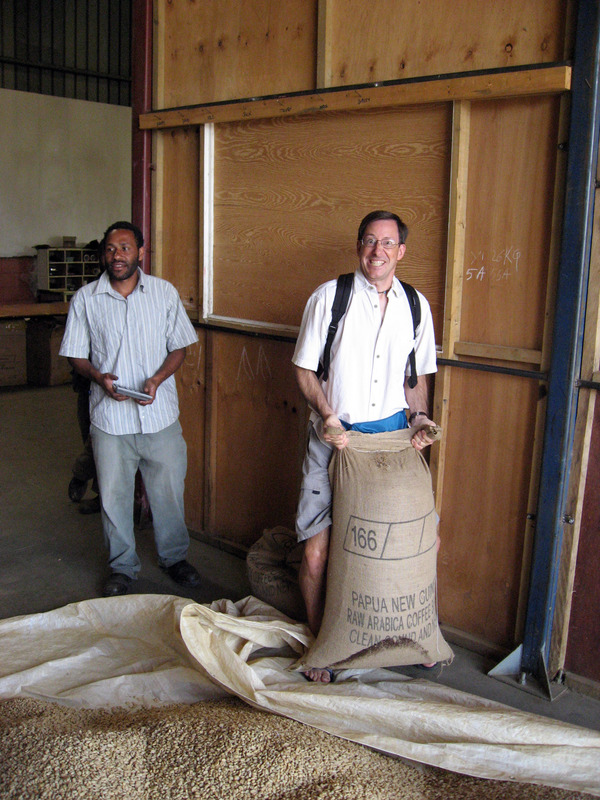 Here is Randy lifting one of the coffee bags. It is 60 kg (132 pounds). Randy worked in our family grass seed business for a couple of summers (years ago) and wanted to heft one of the bags which are QUITE a big heavier than the ones on our family farm (our standard bags were 50 pounds). Here is a picture of Randy standing in the Salem Oregon Grass Seed Cleaner many years after he worked there. 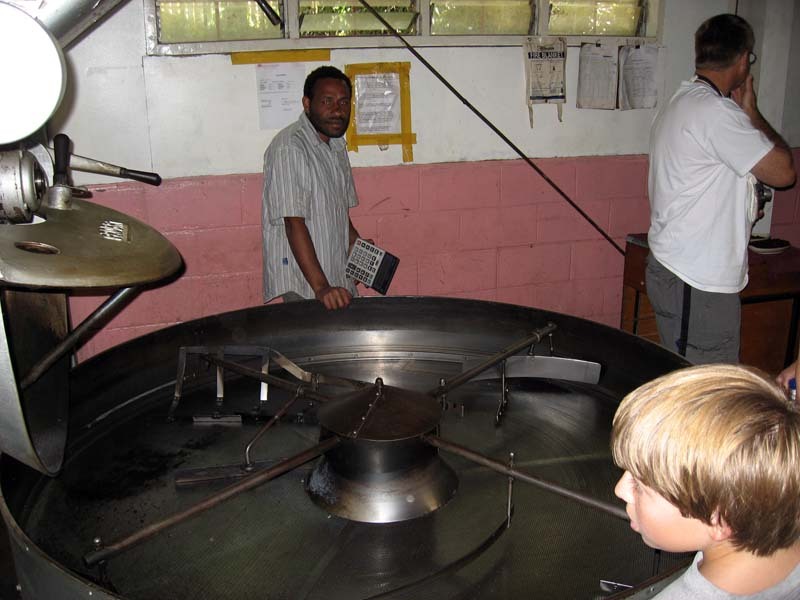 A picture of the coffee roaster in the Arabicas Coffee Factory, Goroka, Papua New Guinea. Another picture of the same coffee roaster. 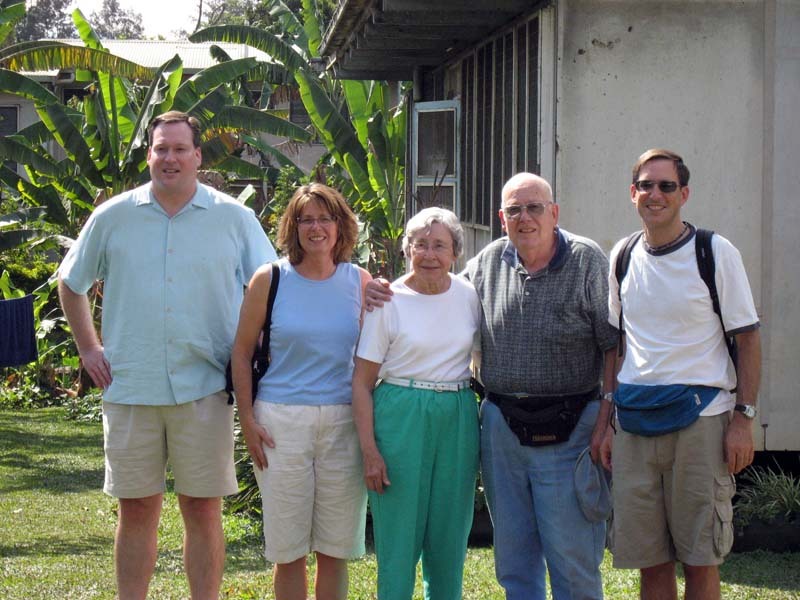 A picture of our family meandering about in the coffee factory. 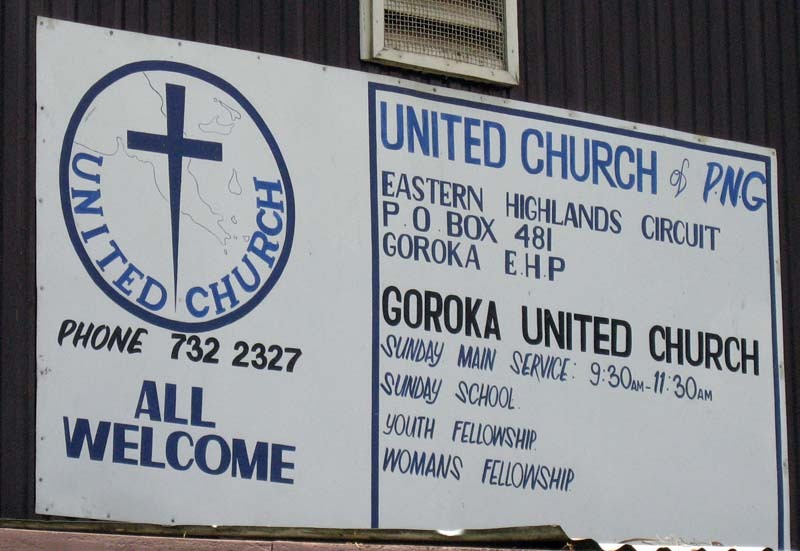 A close up of the sign on the church which reads, "United Church of PNG, Eastern Highlands Circuit, P.O. 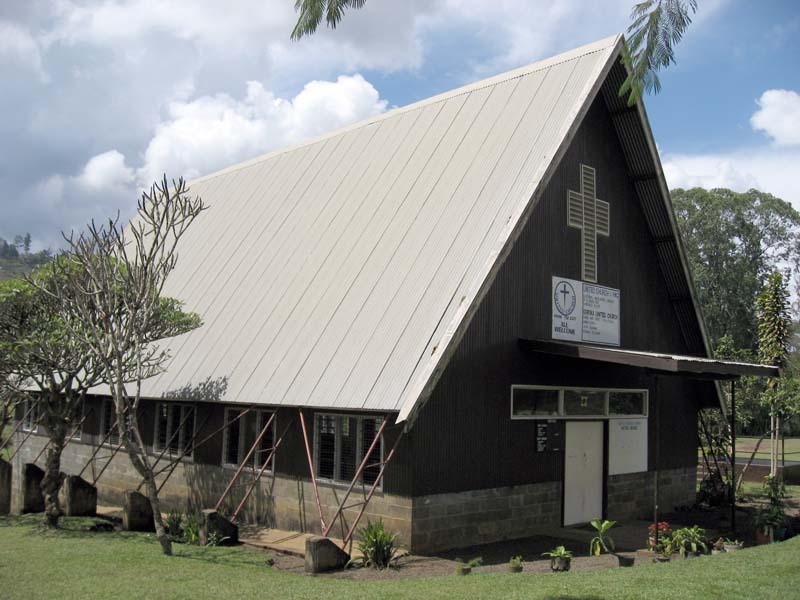 Box 481, Goroka EHP, Goroka United Church Sunday Main Service: 9:30am - 11:30am, ALL WELCOME". 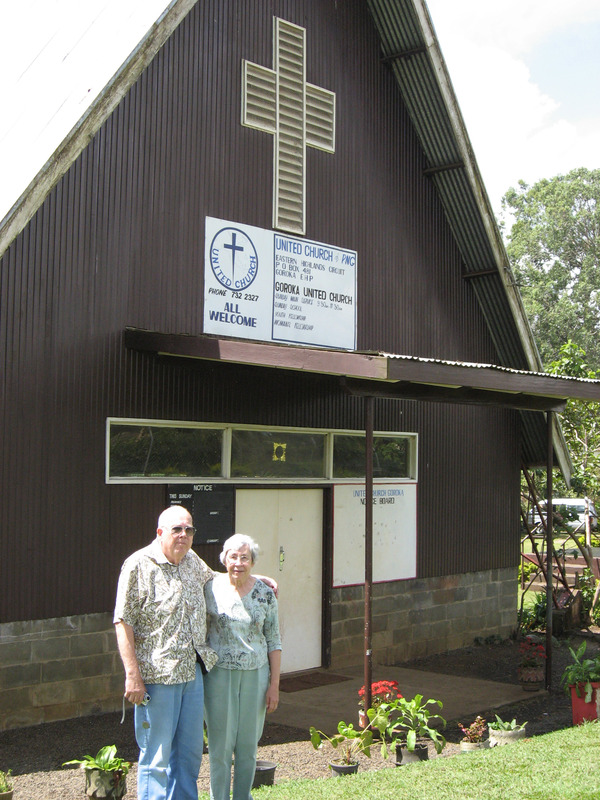 Howard and Virginia Wilson in front of the church. 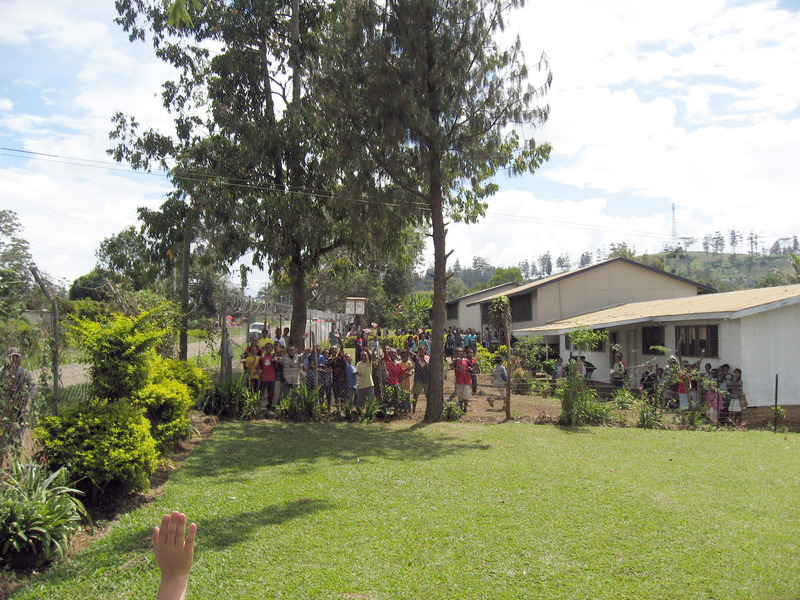 A panorama of the Goroka school and playground (it was recess time with students out playing) when this was taken. FINAL TOUR STOP in Goroka -> Brian and Randy chew Betelnut!! This one makes me really happy. :-) When were were here 35 years ago, the locals would chew betelnut (the locals call it "buai" pronounced "boo-eye"). It took me YEARS to realize out it was giving them a "buzz" of some kind. When I looked into it, I found out betelnut is chewed all over the world, and used as a spice and flavoring in many countries (my friends from India call it 'paan', and one of the delicacies in India is called 'supari' which is a mix of sugar and betelnut wrapped in a mint(?) leaf ready to pop in your mouth after a meal. I had a hard time buying fresh soft betel nut in the San Francisco area in the United States, but I did buy extremely hard dried betelnut (not chewable!) in a store catering to people from India. 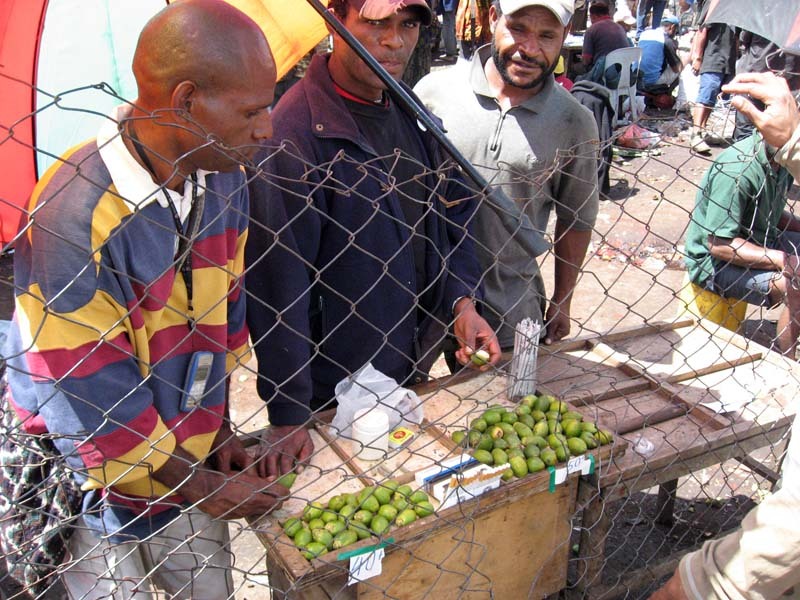 ANYWAY, below are some street venders in Goroka, Papua New Guinea selling fresh betelnut. John Rupa (our friend and guide for the day) showed us the procedure. You must chew and mix "mustard", "lime", and "betelnut" to produce the chemical reaction in your mouth. It turns red when successful, and the successful chemical reaction produces an extremely mild stimulant effect about like drinking a cup of coffee. The "mustard" is a green-bean like thing the locals call "daka" that comes free with every betelnut. You normally carry your own lime around with you in a small container (see picture below). The locals call "lime" by the name "kambang", and it's powdered calcium carbonate. 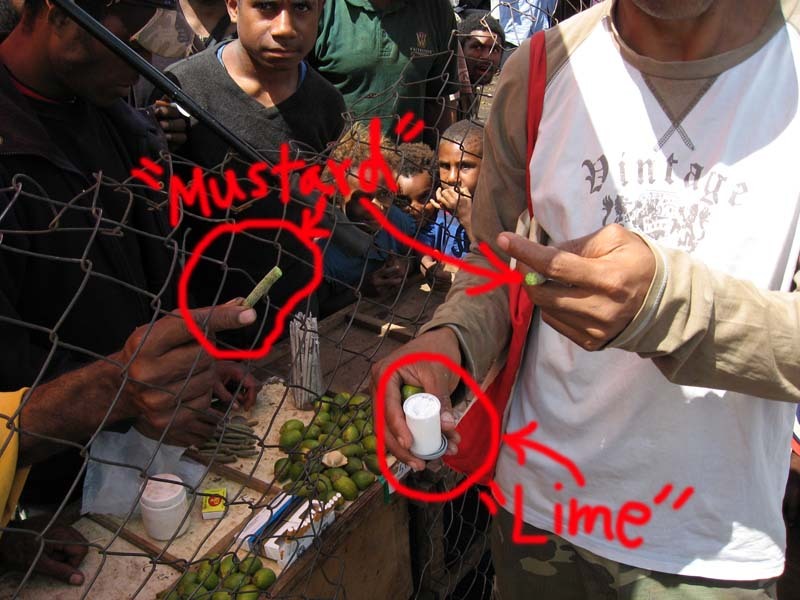 You first shell the outside green off the white betelnut, then pop the betelnut in your mouth and start chewing, then every few chews dip the mustard in the lime and bite off 1/4 inch of lime powder covered mustard. The lime powder can burn a little, so you push the lime covered end into a bunch of betelnut and don't touch it to your mouth until well mixed into the betelnut. It takes maybe 30 seconds and when you finish the mustard stick your mouth turns bright red. Below is a picture of all the components in John's hands. The green things on the table are the UNSHELLED betelnuts (you shell them to get at the very soft nut inside, about the size of a small walnut but very soft). 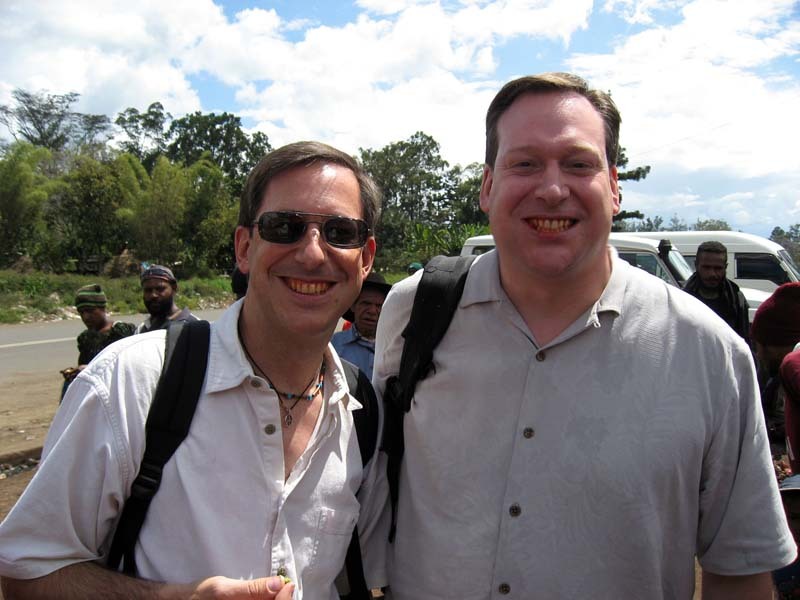 Randy on the left and Brian (me) on the right smiling to show the betelnut red in our mouths. The taste is quite mild, I expected the feeling and taste to be as extreme as chewing tobacco for the first time (which can make you vomit) but betelnut is MUCH easier than that! The flavor is not overpowering, more like a mild green leaf flavor, and the feeling really is as mild as about 1 cup of coffee. A "big" betelnut chewer will chew 10 - 20 betelnuts per day, each one stays in their mouth for maybe 5 minutes before spitting it out. You can swallow the juice if you like, it won't cause even an upset stomach, but most people spit (which is why you see big red stains on the ground everywhere). You DO NOT swallow the pulp of the betelnut once it's done, everybody spits that out. Here is another good webpage describing how to chew betelnut in Papua New Guinea. At the end of the day, Randy and I spent 3 hours sitting in an Air Niugini office at the airport trying to get confirmation numbers and printouts for our correct flights the very next day (to make absolutely sure we could leave Goroka and continue on to Madang, Papua New Guinea). Anywhere else in the world our request would take 5 minutes, but the Air Niugini representative sat there for 3 hours "fighting" with her computer. It was incredibly painful to watch. At one point she rebooted the computer, probably because she didn't know how to exit out of some screen. 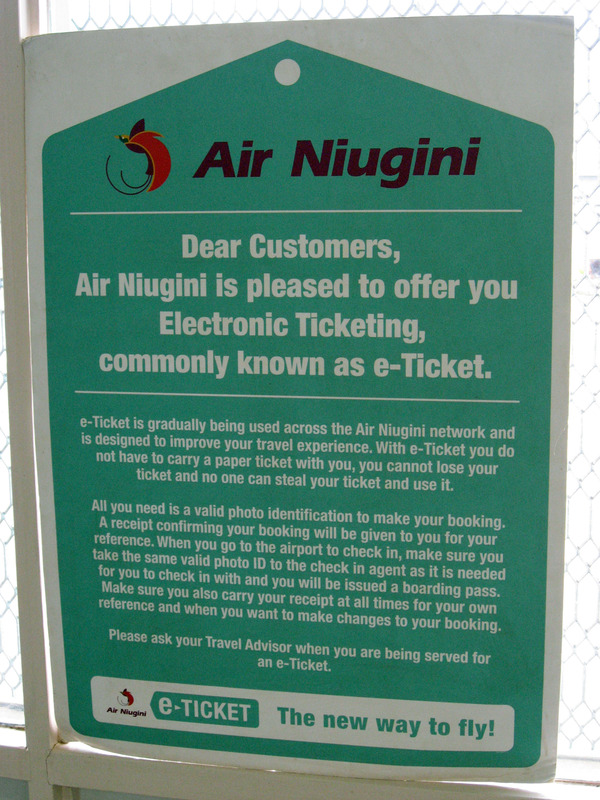 The sign below PRETENDS Air Niugini can function with computers, but it's not true, their employees have no training and cannot successfully use any form of computer. 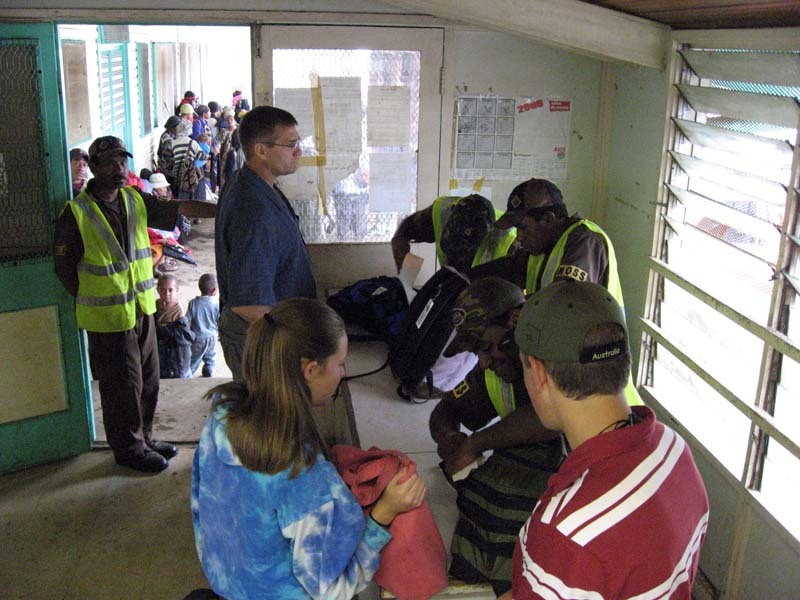 Here we are in the airport the next day (Tuesday, July 29th, 2008) ready to leave Goroka headed for Madang. 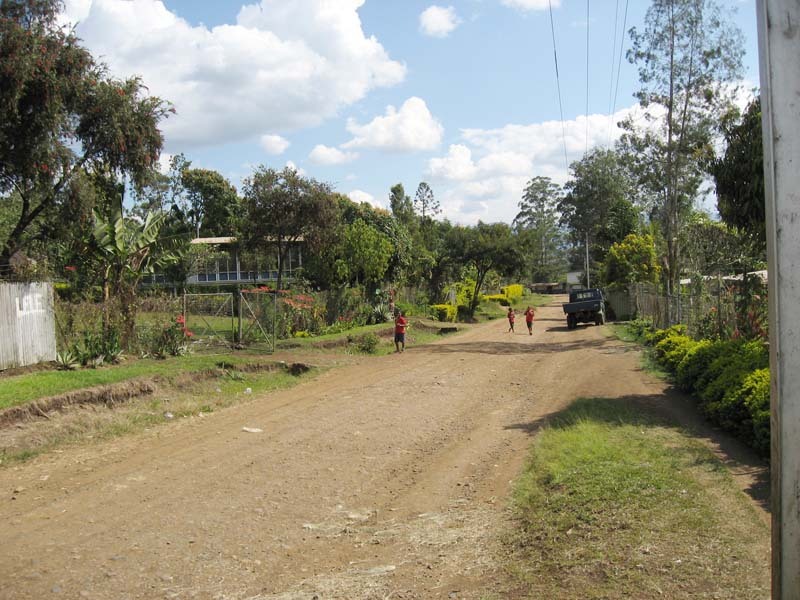 A few pictures of the Goroka Airport for fun. 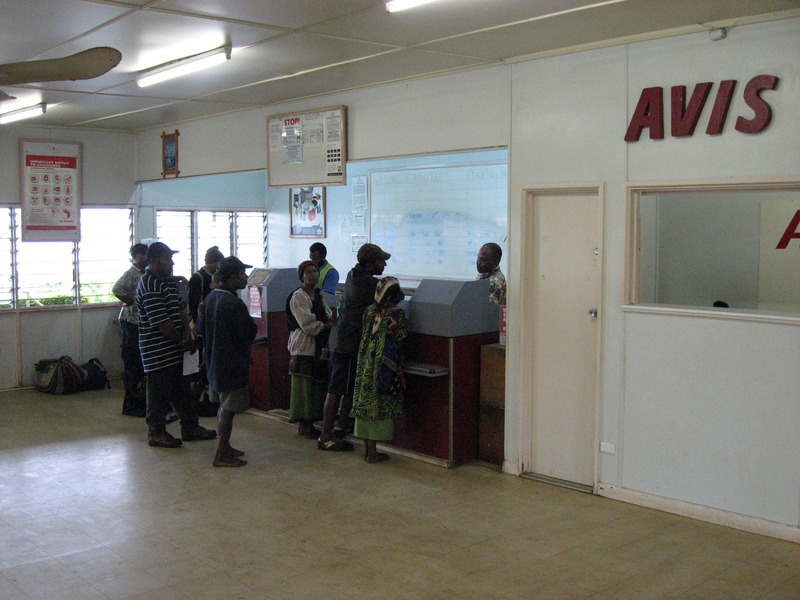 Below is the check in counter at the Goroka Airport. 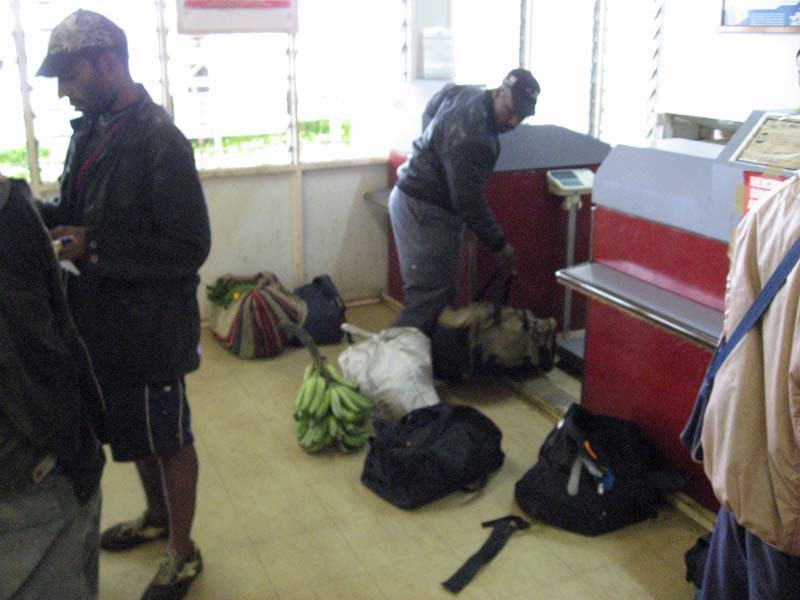 I liked how somebody was checking in a bunch of bananas as luggage in the picture below. 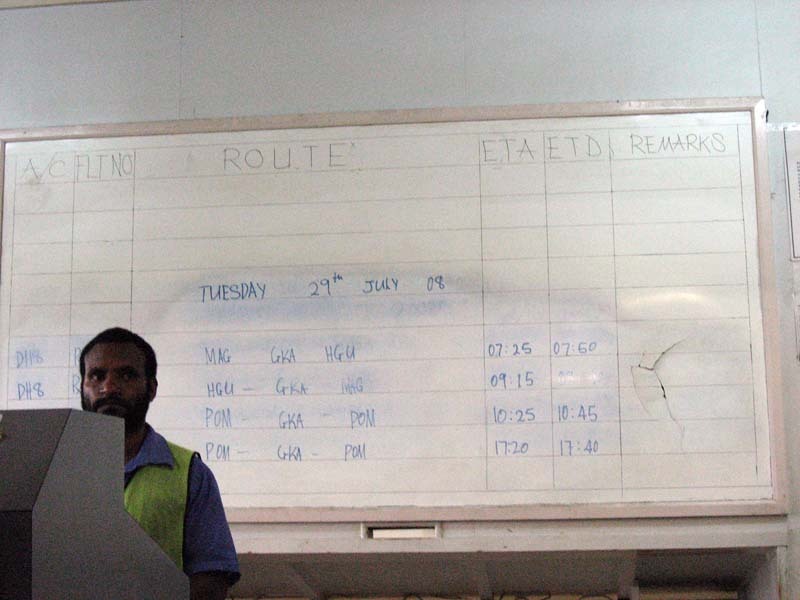 The Air Niugini display of flights is a whiteboard. The guy would turn around, erase a flight and update it and PRESTO, Air Niugini was flying a new route. 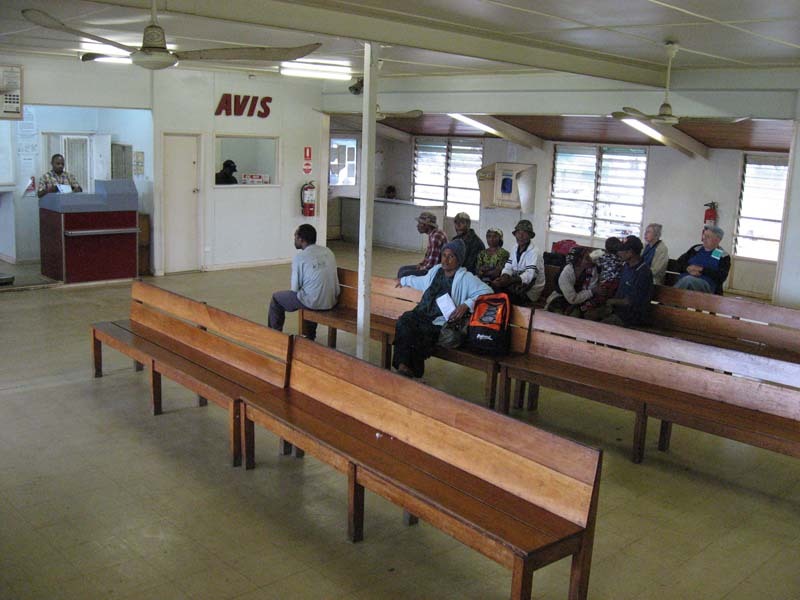 Another angle to see the waiting room in the Goroka Airport. Dad says it hasn't changed much in the last 35 years. This is the end of the "Goroka Tour" webpage, next is "Madang".